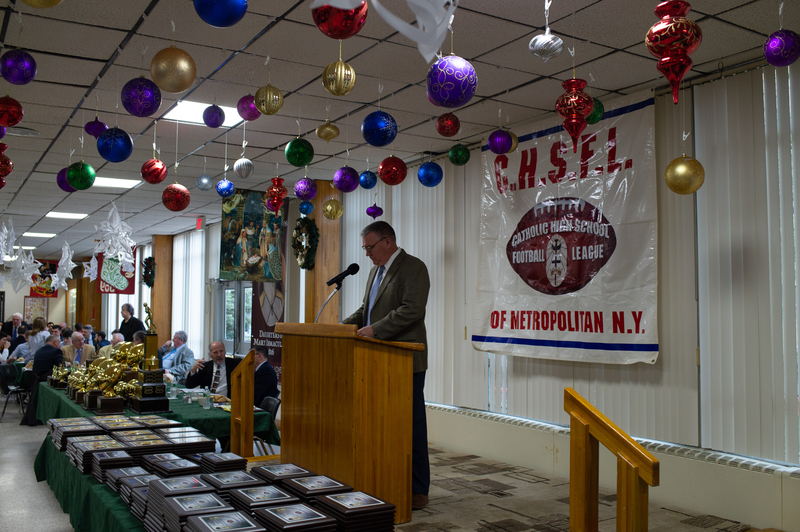 As we closed the book on another action-packed season of NYCHSFL football and commenced with the process of bidding farewell to our treasured class of 2019 members, we did so in the manner in which the Lord has taught us, by sitting down as one league, one community, and one family to partake in one of our grandest rituals, the Annual Communion Awards Breakfast. 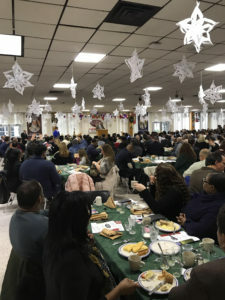 Hosted once again on the campus of Kellenberg Memorial High School, prior to breaking bread and paying homage to our best and brightest performers from the 2018 season, celebrant, Father Albert Bertoni SM would impart upon his congregation the lessons of Luke 21: 25-28, 34-36, reminding the captive audience that Jesus will reveal himself in a variety of forms. Therefore, we must always be attentive to the signs in the sun, the moon, and the stars for the return of our savior in the clouds. 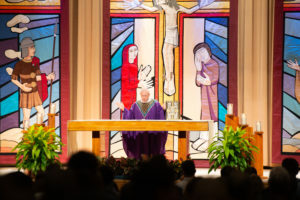 Perhaps not quite the literal definition of this gospel passage, but in reflecting on all of the “power and glory” that our esteemed honorees brought with them to the field every day for the past three months, it was not difficult to spot the presence of God in these present-day stars!!! 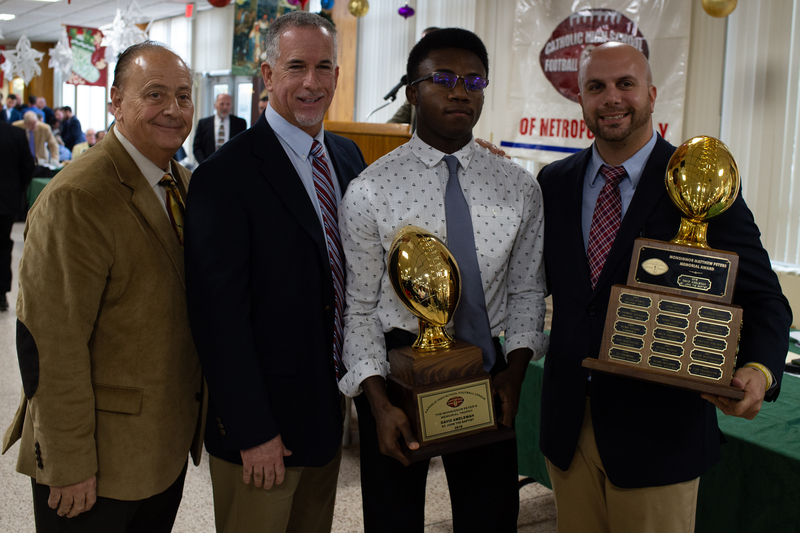 Claiming the morning’s most prestigious and cherished distinction, the Monsignor Matthew Peters Award, in recognition of being named the top scholar-athlete in the NYCHSFL this season was St. John the Baptist senior running back/defensive back, David Amelemah…A two-year starter and three-year member of Head Coach, Ralph Carusillo’s varsity squad, the resident of Amityville finished third on the team in rushing yards (157 yards on 30 attempts), while also ranking in the top-10 among SJB tacklers with a defensive stat line that included 21 stops and one interception…However, while his contributions on the gridiron were nonetheless outstanding, what would set Amelemah apart from his peers this season would be the breadth of resume he possesses in all areas of his scholastic journey…On pace to be the salutatorian (second highest grade point average) of the class of 2019 at the West Islip based high school, the 17-year-old, three-sport athlete (also runs track during the winter and spring seasons) holds an average of 104 while enrolled in a curriculum that includes several advanced placement and honors courses. He scored a remarkable 1530 on the scholastic aptitude test (SAT), darn-near achieving a perfect score in the mathematics section with a 790…Having already been an invited participant to the Cornell University CATALYST Academy, as well as having secured a six-year internship with National Grid, this future engineer is equally as selfless as he is brilliant. A retreat leader, a mentor in the Big Brothers/Big Sisters program, active in Habitat for Humanity, while also serving as a volunteer at both Good Samaritan Hospital and the Long Island Cares Corporation, Amelemah is the epitome of all the values in which we hold sacred within our league, thus making him a perfect selection. Hailed for their abilities to consistently dazzle the crowd with spectacular exploits with the pigskin in hand were a quartet of senior showstoppers—Derek Robertson (Iona Prep), Greg Campisi (St. Anthony’s), Matthew Sluka (Kellenberg Memorial), and Myles Proctor (Kennedy Catholic)—who are this year’s recipients of the Offensive Player(s) of the Year in their respective divisions. So special and paramount to the successes enjoyed by their schools, when it came time to pick this year’s Joseph Riverso Memorial Award winner (AAA Offensive Player of the Year), it became apparent that the only way to truly achieve justice and fairness was to establish a precedent and recognize TWO heralded signal callers in the persons of Robertson and Campisi. Throwing for a Westchester County record of 2,774 yards as a junior in 2017, the two-year starter under center for the Gaels [Robertson] may not have succeeded in breaking his own milestone this season, but was quite extraordinary in every other possible way…Topping all triple-A field generals and finishing 5th overall in the Empire State in both categories in his swan song, the 6’2, 185-pounder out of Yonkers would complete 201 of his 312 attempts (64.4%) for 2,556 yards and 31 touchdowns in leading Iona Prep to a 7-2 mark this season…Combing to hurl for 5,330 yards and 58 touchdowns during his tenure in New Rochelle, Robertson led the Gaels to the AAA semifinals in each of his two years as the starting quarterback…He becomes the third Gael this decade to receive the Riverso, joining the likes of Mario Biaggi (2012) and Robert Madison (2014). Bound for Harvard University next fall, there may never again be a dual-threat quarterback the caliber of Campisi in South Huntington. 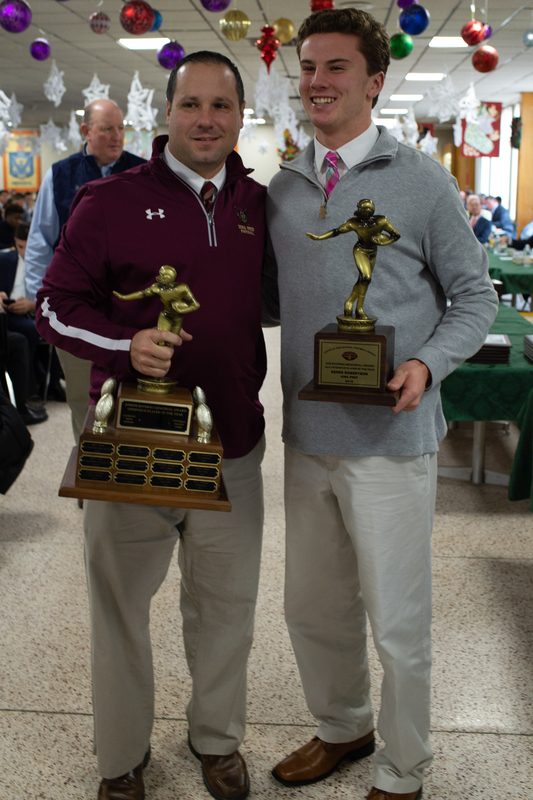 Absolutely unstoppable at times during his 2.5-year reign running the Friar offense, the 6’1, 175-pounder contributed two NYCHSFL regular season titles and a 2017 runner-up finish to the rich STA football history, as he compiled an incredible 19-3 record against New York Catholic foes (21-4 overall)…Named Honorable Mention All-State as an 11th grader last year following a season where he accumulated 2,432 yards and 20 touchdowns of total production, Campisi would surpass all of his previous personal bests in his final season donning the Black & Gold…Named to the Newsday All-Long Island 1st team earlier this week, #11 would have a senior campaign for the ages, completing 60.3 percent of his throw attempts (138-for-229) for 2,109 yards (3rd in AAA) and 25 touchdowns (3rd in AAA), while simultaneously rushing for 942 additional yards and scoring 12 more times to account for a mind-blowing 37 TDs in 2018…Closing out this chapter of his football career having thrown for 4,879 yards and 47 touchdowns, and run for 1,641 yards and 24 scores, Campisi may have never won the AAA league title, but he certainly won the hearts of all NYCHSFL aficionados and enthusiasts…Campisi is the first Friar since fellow signal caller, James Brady (2007), to win this award. 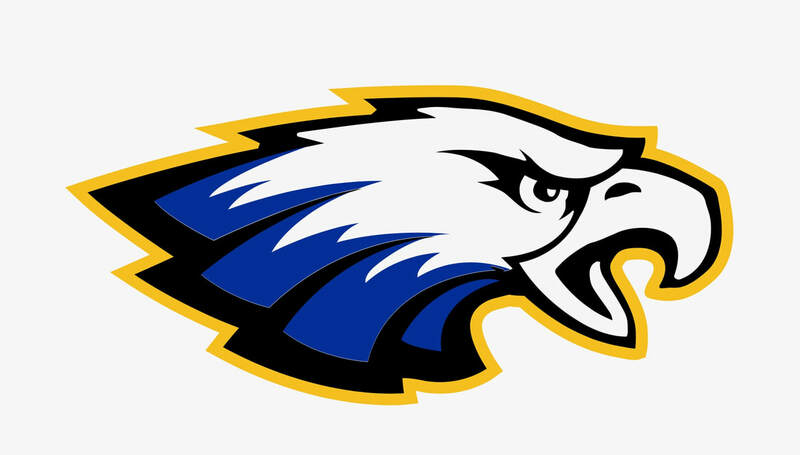 Never tasting defeat (22-0) in his two-year varsity stint as the field general for the KMHS Firebirds, 2018 must have felt like déjà vu for the Roslyn resident [Sluka], as he complements the back-to-back Double-A team titles he won with the Blue & Gold juggernaut by adding a second All-Long Island 1st team designation this past Wednesday and now a second consecutive NYCHSFL Player of the Year plaque to his mantel…The centerpiece and/or focal point for an offensive cohort that averaged over 40 points per game in both of his seasons taking the snaps, the 6’3, 205-pound red-headed stud leaves behind a legacy in Uniondale that will forever survive the test of time…Inheriting a program that went 1-8 in 2016, Sluka’s influence would bear witness to Kellenberg rising to the #3 ranking in NYS in the latest polls…A 2nd-Team All-State selection in 2017, it goes without saying that when the NYSSWA releases the 2018 edition, he will again be featured prominently…A year removed from a 2,603-yard (1,619 on the ground; 984 in the air), 36-touchdown (24 rushing, 10 passing) all-purpose season as a junior, Sluka would be even better this season, as his commitment to the development of his passing skills would yield a 69.2 percent completion rate (74-for-107), as he tossed for 1,203 yards and 14 touchdowns…The emergence of All-League running back, Jordan Delucia (led AA with 1,380 yards) meant that Sluka would not need to be as busy with his legs. But still, despite calling his own number on fewer occasions, the Marianist gem would be the NYCHSFL TD king on the ground, finding pay dirt on 22 separate occasions as a part of an 1,131-yard effort…Posting 11 touchdowns (seven rushing, four throwing) in two title game appearances (2x Offensive MVP) in 2017 and 2018, perhaps what fans will miss most about Sluka next season is his propensity to play his best when the stakes were their highest…The first NYCHSFL player since Matt Hahn (St. Anthony’s; 2002/2003) to repeat as an Offensive Player of the Year winner, Sluka is the third Firebirds this decade to earn the award, joining Matthew McDaniels (won the AAA award in 2011) and Bobby Musso (A/AA recipient in 2014). A true breakout star during the 2018 season, Proctor, alongside teammate, Seth Surrett, would traumatize opposing defenses this year, finishing as the top-2 runners in the A-division and combining to gain close to 2,000 yards and score 19 touchdowns…Just barely edging out his “partner in crime” in the rushing yards race, Proctor finished second to Surrett in touchdowns scored, with the former crossing the goal line nine times, while the latter accomplished the feat on 11 different occasions…Together, this dynamic duo would make history in Somers, delivering the first “A” division regular season title to Head Coach, Dom Tassone, and taking the Gaels to championship weekend for the first time in school history…Surpassing the 100-yards running plateau in six of the eight games he played this season (ran for 96 yards in another contest), the 6’2, 190-pounder out of Yorktown Heights was a human highlight reel as a senior, averaging over eight yards per carry…Proctor was twice selected as a POTW in 2018, including an afternoon of career-bests during a week #3 victory over St. Dominic’s where he ran for 215 yards and three touchdowns on just nine carries…By virtue of their senior tailback’s selection, Kennedy Catholic has now claimed this award in the two of the past three seasons, as quarterback, David Keogh, earned the prize in his senior season in 2016. Turning our attention to the other side of the ball, whether it be Lombardi, Ditka, Saban, or any other legendary coach in any sport in this country, the sentiments regarding defense remains the same…Whereas the offense tends to be the face of many winning teams, it is the 11 men on the other side of the line of scrimmage that operate as the heart, soul, and backbone of any perennially successful organization…Three young men who always put their schools in a position to obtain victory, Makhai Murphy (St. Anthony’s), Valery Gwardyak (Xavier), and Cole Esposito (Kennedy Catholic) are precisely the type of individuals that military historian, John Keegan was writing about when he spoke of an “inability to compromise, an unrelenting devotion to the standards of duty and courage, an absolute loyalty to others, and a refusal to let the task at hand go until it is has been sufficiently done.”….Two of our three selections [Gwardyak and Esposito] would be dominant linebackers on divisional runner-up programs, while the third [Murphy] was the shutdown defensive back for not one, but a pair of AAA regular season crowns. Murphy, who finished 2nd in the triple-A division (top-20 in NYS) with four interceptions for the second straight season, was such a feared commodity at the cornerback position that more times than not, he would successfully negate the top receiver on the opposing team, thus creating many a long afternoon or night for adversarial quarterbacks…Tasked with the unenviable challenge of being a D-back in a league that boasted four of the top-20 passing quarterbacks in the entire Empire State, when you look at the numbers that those signal callers mustered versus the Friars as opposed to other secondaries, you begin to garner a deep appreciation for how unique a talent the 5’10, 175-pounder truly is…When St. Anthony’s played eventual league and State champs, Archbishop Stepinac, the Friar defensive backfield held Crusader signal caller, Joey Carino to a 52.4 completion percentage, which was seven points below his season average…In two showdowns this season against returning 3rd Team All-State field general, Sofian Massoud (Cardinal Hayes), from an individual perspective, Murphy notched one INT apiece and the secondary as a whole forced the Cardinal junior into his only two interception game of the regular season and limited him to a modest 106-yard tossing in the AAA semifinals…Competing against another 2018 All-Catholic performer, Farrell QB, Mike Regan, Murphy would post another interception and the last line of defense collectively limited the Lions to 11-for-29 for only 108 yards…The first STA student-athlete since Scott Vallone (2007) to be named the Vincent O’Connor Memorial Defensive Player of the Year, Murphy snaps Stepinac’s four-year streak (Gavin Heslop, Dan Negron, Gene Brown, and Trill Williams). 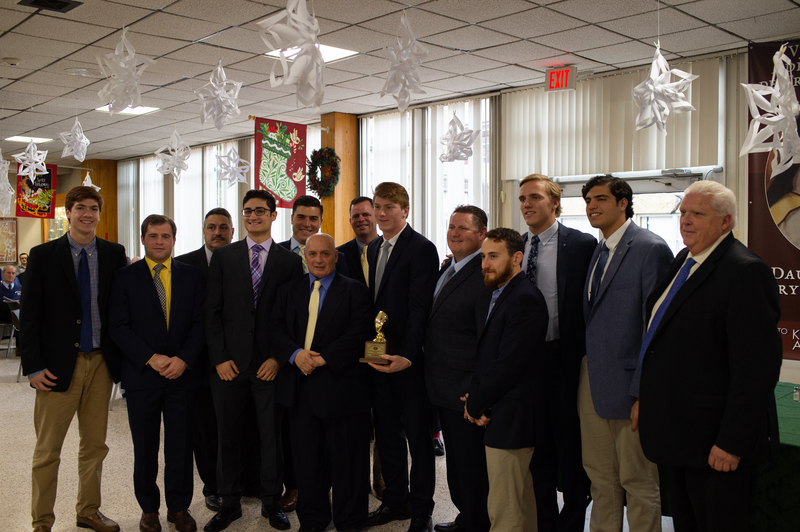 As it pertains to vaunted defensive tradition built by Xavier Knights’ head coach, Chris Stevens, the saying goes, show me a bunch of goose-eggs and I’ll show you a star linebacker at the eye of the storm…Following in the footsteps of Frank Masella (2015), Gwardyak would put an exclamation mark on his incredible scholastic career by captaining the NYC based school back to championship weekend for the first time since winning in 2015…And while the Knights may have fallen short of hoisting the hardware on November 17th, the loss in no way detracts from what was one heck of an individual and unified effort by the Maroon & Blue “D”…Pitching four shutouts during the course of the year, including two straight in the quarter and semifinal round of the double-A playoffs, Xavier may have bent a bit at times, but they hardly every broke during the homestretch…A person who flies to the ball with a natural fluidity and tenacity, Gwardyak would top all Knight tacklers for the second year in a row, reaching the 70+ stop milestone for the second time in as many attempts…Finding himself in the opposing backfield on more than a few occasions, the Staten Island resident would post double-digit tackles for losses this season…In addition, after not being credited with a single sack in his junior year, #44 would rank second on the team in the category with 2.5 QB bags. He would add the first interception of his career to further enhance his solid resume. Like Gwardyak, Esposito too would prove himself to be a revolutionary player, as it would be his stellar play from the LB position that enabled the Gaels to reach the “A” title game for the first time in program history…The second [Sluka above] and final repeat award winner of the morning, the 6’1, 205-pound Cortland Manor native was to the Gael defense what his teammate, Proctor, was to the offense; a God-given play-maker that elevated those around him…A three-year linchpin and/or anchor in the middle of the Kennedy Catholic front-7, Esposito would earn DPOY status in 2017 following a junior campaign that saw him finish second overall in “A” with 95 tackles (12 TFL), while adding three sacks and two caused fumbles…Demonstrating that he had no intention of resting on laurels, his numbers would explode through the roof in his senior year, as he wrapped up his last season as a Gael by being ranked in the top-20 in NYS with 120+ tackles (3rd in the “A” Division), tying for the Empire State lead with 49 stops for negative yardage (tops in the NYCHSFL), and tacking on seven sacks (tied for best in “A“)…Making 10 or more tackles in seven of his team’s 10 appearances in 2018, Esposito would put forth his finest display in the 2018 semifinal round when he accumulated 17 total tackles, while setting new personal records for TFL (11) and sacks (3….Praised a year ago for being a huge reason why Kennedy Catholic was able to shave 10 points off of their per game allowed average between the 2016 and 2017 seasons, Esposito would do it again in 2018, as KC would surrender only 12.2 points per contest this season (8.1 against “A” division foes). 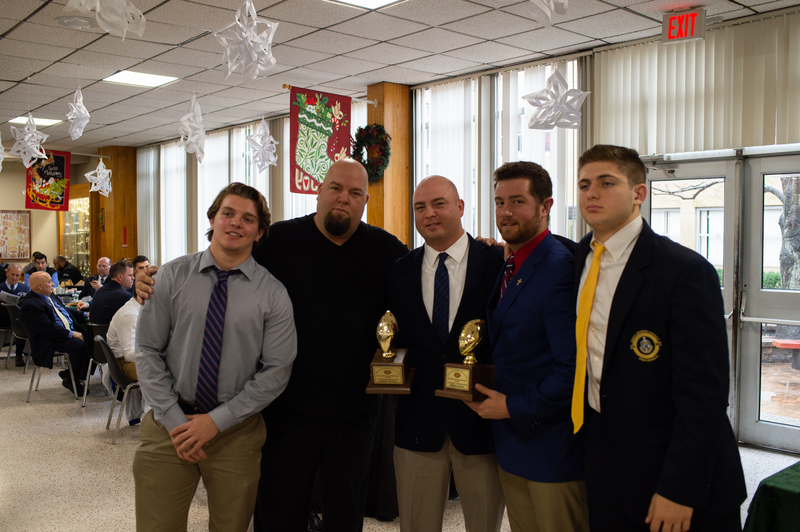 Rounding out our list of distinguished student-athletes that were recognized on Sunday morning were the young gentlemen who have the often thankless and undervalued job of banging heads in the trenches…The proverbial “straws the stir the drink”, if you watch game film at any level of the sport, you will clearly see that nothing worthwhile occurs without a lineman of some kind providing a much-needed spark…A constant clash for territory, there is no purer art in the realm of athletics than the “dance” that these 200-300 pound warriors perform week in and week off…The muscle within a game that is becoming more and more finessed, there is no “half speed” or “plays off” when trying to be the ultimate difference maker in a battle for inches…Leading the charge for this year’s talented OL/DL class were Anthony Bonavita (Iona Prep), Tedi Kushi (Moore Catholic), and Brenton Winter Jr. (Nazareth). Bonavita, one of the most potent and polished offensive linemen in New York State, put himself in a club all his own today, as he became the first IP player to earn the Joe Thomas Award…Standing 6’3 and tipping the scales at an even 300 pounds, the Irvington resident certainly passes the eye test of what a dominant lineman ought to resemble…However, in bestowing upon him this honor, the selection committee looked more at the measurement of his skillset than at his physical stature…Simply put, this is a beast that knows how to push people around…In fact, so good was Bonavita this season, that it could be argued that without him serving as primary protector, Robertson’s candidacy as OPOY would have greatly compromised…Part road grader, part body guard, no matter what was asked of him this season, Bonavita would go above and beyond the call of duty in all endeavors…Paving the way for a Gael running attack that accumulated 1,500 yards (167 per game) and scored 19 touchdowns, as well as kept Robertson and his 2,556 yards + 31 touchdowns in the air upright, the Iona Prep senior OL provided the grit and foundation for an offense that ranked 1st in AAA in points per game (40.8) and averaged 452 yards of total output. 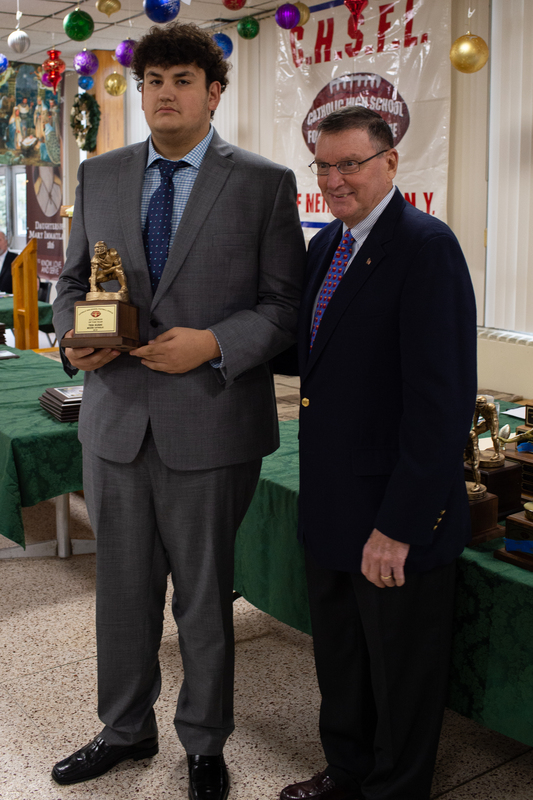 Kushi, who at 6’6 and 330 pounds might be one of, if not the only Catholic League football player capable of making Bonavita look small by comparison, would be our favorite kind of linemen, a two-way, 48-minutes a day, unapologetic animal for the Mavericks….Named to the All-Catholic team for the third time in his scholastic career, the mainstay at left tackle for Moore Catholic would be an invaluable asset as both a lead blocker and a blindside watchdog…Running through the tunnels built by their massive senior OT, the Mavs’ assortment of rushing options (led by sensational junior, Justin Lacks; 1,161 yards, 19 touchdowns) would accumulate 2,000 yards (222.1/game) of ground production, scoring 27 touchdowns…Aerially, senior quarterback, Vincenzo Scarola, would make the most of the clean pocket, as he hurled for career highs in yardage (971) and TDs thrown (11)…All in all, the MC offense averaged 348 all-purpose yards while scoring 34.2 per outing. This represented a 7.5-point and 88-yard improvement in one year’s time…Already established on the offensive side of the gridiron, Kushi’s greatest area of improvement came on “D” where he went from making just 13 stops as a junior to being one of the most menacing and disruptive DTs in the league, as evidenced by his 48 tackle, .5 sack, two fumble recovery showing as a 12th grader…And just as the points scored average would increase, the points surrendered stat would fall from 26.7 (2017) to a 17.8 (2018). 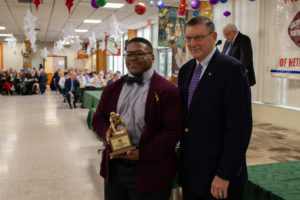 Just the second ever Kingsmen to amass individual honors (the other being 2015 Defensive Player of the Year, Tariq Gordon), Winter Jr. would set the tone for a program that performed considerably better than their 1-8 tally might suggest…Gelling by the end of the 2018 season, Nazareth Regional would lose both games, but succeeded in pushing “A” champions, Cardinal Spellman and divisional runners-up, Kennedy Catholic, to the brink, losing by respectable scores of 9-8 and 21-12…A diamond on a roster of promising but still developing coal, Winter Jr. would leave no doubt as to his prowess as a pass rushing specialist, leading the “A” division with five recorded QB hurries and finishing tied with Esposito for the top honors with seven sacks…In addition, he would raise his stop total from 19 in 2017 to 32 in his last hurrah donning the Maroon & Gold jersey. 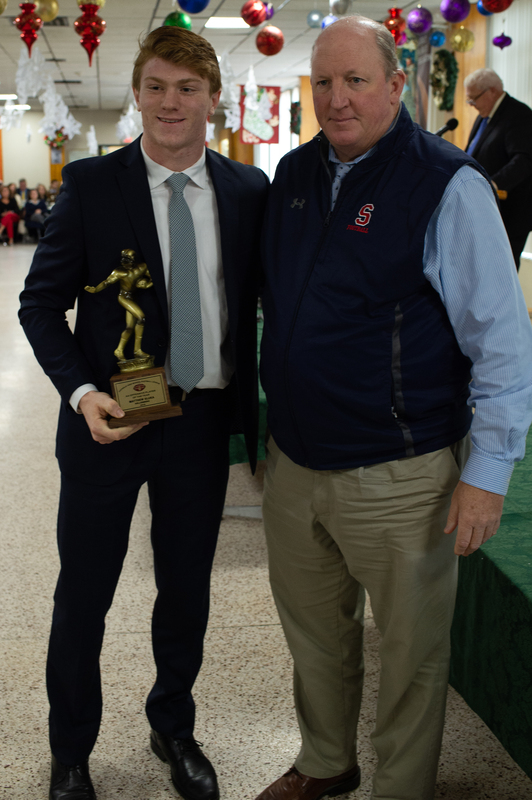 One final gentleman most certainly worthy of commendation and acknowledgement is St. Anthony’s senior defensive back, Peter Hagan. One of those rare exceptional human beings whose contribution to his team and his school transcended what appears within a box score, repeatedly throughout the 2018 season, the 5’11, 175-pounder conducted himself as the consummate “team-first” ally, putting the best interests of the Friars ahead of any personal acclaim or fame…It was due to this ideal demeanor that there was no more fitting a candidate to be the recipient of this year’s Lieutenant Ronald Winchester Award, presented to the person deemed to be the unsung hero of the roster…Handed out in tribute to the former Chaminade High School/United States Naval Academy offensive lineman who sacrificed his life on September 3rd while fighting for his country in Operation Iraqi Freedom, Winchester was described by former teammates as the “guy who was behind the scenes making the block that no one saw; the guy who would play with broken ribs; the guy who stood out because of his work ethic.”…Like Winchester, Hagan has made his patriotic vow, accepting admission into West Point (United States’ Military Academy) as a part of the class of 2023. Congratulations to our decorated student-athletes…And to all of our departing seniors, we whole-heartedly thank you for the wealth of memories you leave behind…Win or lose, you always did yourselves, your families, your school, and our league mighty proud! 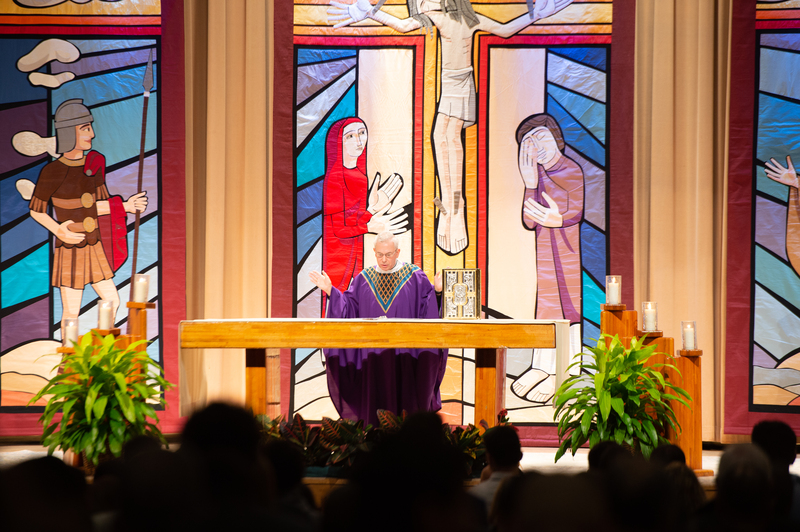 May your future journeys, both on and off of the field football field be met with continued blessings and wisdom from above. 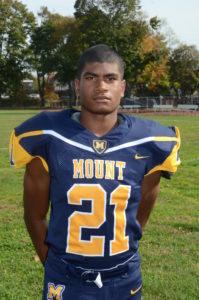 Playing for the first time this season as a “solo act” in the backfield after it was announced that his band mate”, Myles Proctor (Single A rushing leader with 978 yards) would be sidelined for their semifinal game against Nazareth Regional, the 5’10, 180-pound Newburgh native [Surrett] would clarify that even if he wears jersey #2 and entered the game trailing his teammate for the top spot among all A Division runners, he most certainly does not play second fiddle to anyone in the NYCHSFL. 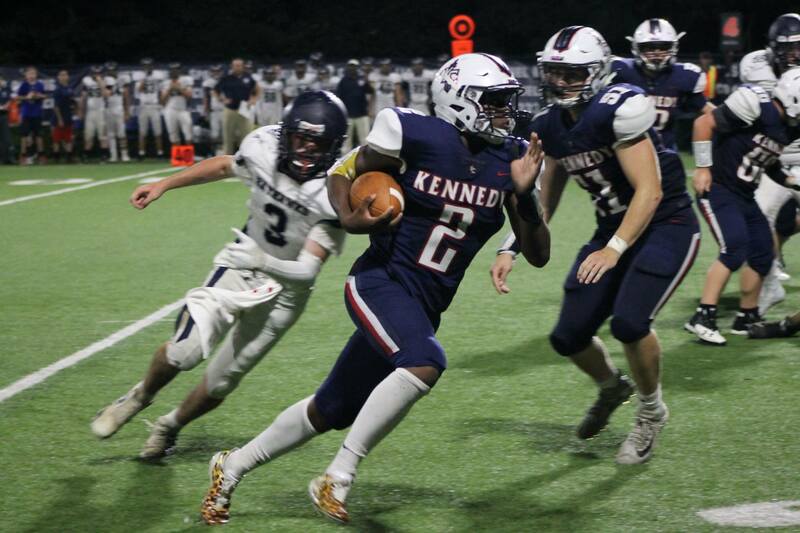 The first student-athlete of the 2018 season to be named a Player of the Week on three separate occasions (previously recognized during weeks 1 and 4), the Kennedy Catholic senior would score all three of his school’s touchdowns in their 21-12 victory at home last Friday night. A defensive stalemate for first 17 minutes of competition, Surrett would break the ice with approximately seven minutes remaining in the opening half when he punched in his 10th rushing touchdown of the season from the 1-yard-line to make the score 7-0 Gaels. With the KC advantage cut to 7-6 early in the 3rd quarter, again it would be Surrett providing the spark, as he responded to a Nazareth punt by exploding up the middle, cutting to the outside, and then side-stepping a Kingsmen defender to go 42 yards to the house to increase the lead to 14-6. His third and last score of the evening came about two and a half minutes later (7:08 remaining in the 3rd), when on 3rd-and-8 from his own 33, Surrett would showcase his abilities as receiver, making the grab on a screen-pass and then simply out-running the entire Naz defense, as he cruised 67-yards in front of his own sideline for the backbreaking TD that made the score 21-6. 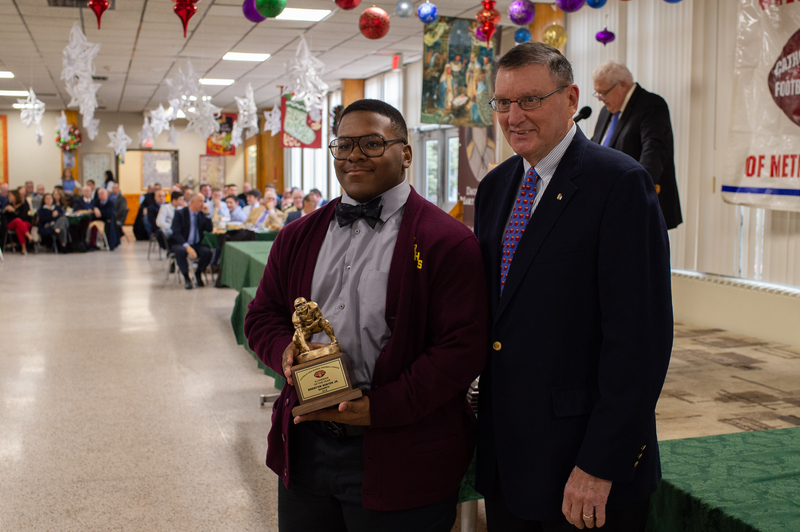 All in all, by the time the final horn sounded, Surrett had broken his previous career-highs for carries and rushing yards by handling the ball 23 times for 194 yards. His two touchdowns on the ground marked the fourth time (2x against Nazareth) this season he ran for multiple scores…His three total TDs was the most he had posted since having a three rushing + 1 receiving touchdown effort in the week #1 win over St. Dominic’s….The 261 yards of all-purpose contributions was a new personal-best. Defensively, he rounded out his night by making four stops, including one for minus yardage. 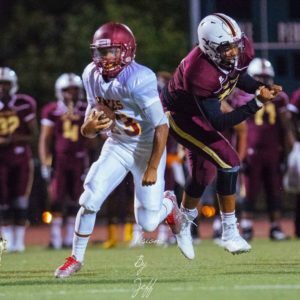 Now one win away from claiming the first NYCHSFL crown in program history, all that stands in the way of Surrett and the Gaels from taking the trip to Titletown is a third showdown with the defending champions, Cardinal Spellman….Aiding his school in sweeping the regular season home-and-home series by identical 21-7 scores on September 29th and October 26th, Surrett combined to rush for 145 yards and three touchdowns on 18 carries (8.1/carry) between the two contests…Dangerous in any situation where the pigskin is in his arms, he also returned a punt 80 yards for a touchdown during the second meeting. 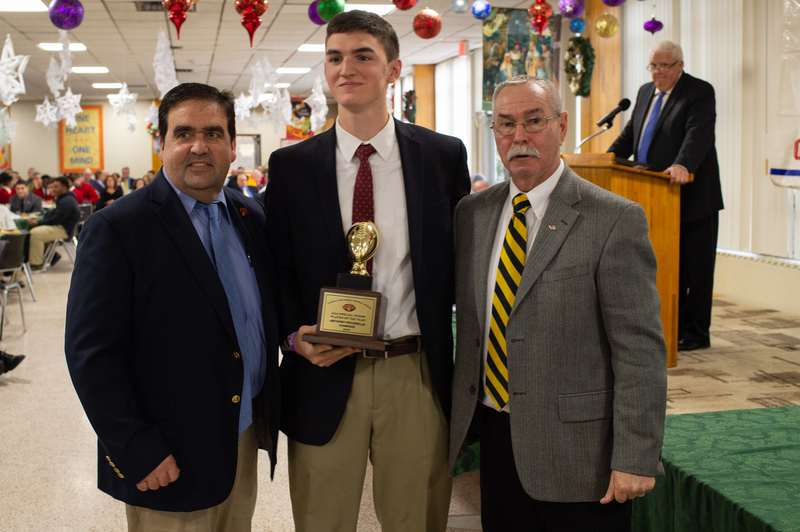 EDITOR’S NOTE: Last Years NYCHSFL “A” Defensive Player of the Year, Cole Esposito, The 6’1, 205-pound Cortlandt Manor resident played what was statistically his finest game ever as a three-year member of the Gael varsity…Falling one tackle short of tying his personal-best of 18 that he established against St. Joseph’s by the Sea on October 19th, it would still be a record-breaking night for #51, as his 11 tackles for a loss and three QB bags were new career-highs. He cemented his phenomenal performance by generating a turnover on his third forced fumble of the season. For the fourth straight season, William Cawley and the Cardinal Spellman Pilots will be advancing to championship weekend. 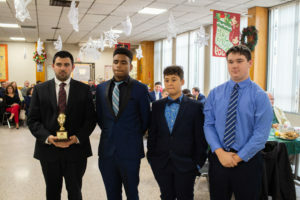 The Bronx based school successfully earned the right to defend their “A” division crown this past Saturday when they shutout their guests from Oyster Bays, the St. Dominic’s Bayhawks, for the third time this season, 23-0. Setting the example on both sides of the ball for our defending champions would be the 6’0, 202-pounder local product [Ortiz] who pulled off the rare “double-play” on November 10th, scoring points on both offense and defense. A seldom utilized option out of the backfield in 2018, Ortiz entered the game having carried the ball just 12 times this season for 97 yards…However, despite only taking one hand-off for an 11- yard gain in the two regular games between the two schools, the Pilots’ coaching staff must have seen a match-up they felt they could exploit, as Ortiz would be fed a season-high eight times last weekend, gaining 40 yards and scoring one of the three rushing touchdowns earned by Spellman. This was just his second TD of his junior campaign, with his first introduction to the end zone coming all the way back during a week #4 loss to the Pilots’ finals opponent, Kennedy Catholic. 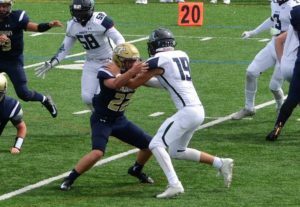 Defensively, the 11th grader would be equally imposing, as he tied his career-high of 20 tackles (previously set against this same Bayhawk squad on October 6th), including one stop that in the Dom’s end zone that resulted in a safety. These two points would give Ortiz eight overall on the afternoon, making him the team’s leading scorer for the day. Taking into consideration that the path to a Spellman repeat will likely involve the ability to shutout the 1-2 punch of Proctor and Surrett, it goes without saying that #34 in Scarlet & White will need to be at his best on November 17th…In two games this season against the Gaels, he has averaged 13.5 stops. As impressive as this may be, the bar may be set even higher if the “w” is in the cards. 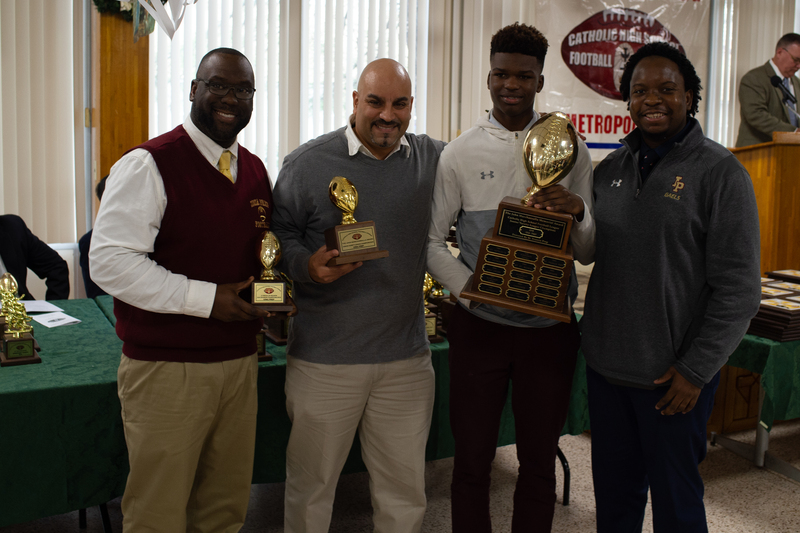 As Knights’ Head Coach, Chris Stevens, phrased perfectly, “What a difference a few weeks can make.”…When Xavier and Holy Trinity met during the regular season on October 13th, the two school combined to score 57 points (29-28 Titan victory) and accumulate 664 yards of total yardage. 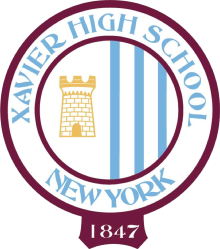 This past Sunday, in a CHSFL double-A semifinal contest that pitted the #2 seeds from the Eastern Conference [HT] against the #3 from the West [Xavier], points would be at a premium and the NYC school would get their revenge, as the lone score of the game would come in the last 90 seconds of the third quarter when Anthony Bruno finished out a 92-yard drive with a touchdown run to send the Knights back to Championship weekend for the first time since they won it all in 2015. 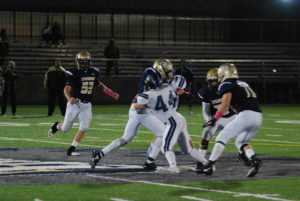 Opposed by a Titan offense that took the field averaging 33 points and just under 305 yards of total production (249.9 on the ground), the Knights would be unrelenting and punishing in their pursuit of Holy Trinity ball carriers…Holding their hosts from Hicksville both scoreless (the third consecutive shutout posted by the Maroon & Blue) and under 100 yards rushing for the first time this season, there is no doubt that we are witnessing a flashback to the days of Frank Masella, Zach Cilmi, Rory Kinsella, Anthony Pugliese, Clayton Kendrick-Holmes, Malik Fisher, and all of the other members of that impenetrable defense from three years ago that swallowed up enemy running backs like a black hole…The only difference is that the names and faces of the personnel have changed…Instead of the gentlemen cited above, the new wave of superstars are known as Valery Gwardyak, James Donaldson, Kevin Connelly, Jordan Sosa, and especially the 6’0, 235-pounder out of Yonkers, [Milton] Guzman. Hailed by his head coach for the ideal timing of his big afternoon, Guzman had would be credited with a season-high 10 stops (4 solo, 6 assisted) in last Sunday’s semifinal triumph…Entering the game tied with Sosa for the team-lead in tackles for a loss, #54 for Xavier now sits alone atop the stat sheet, as his two TFLs give him 11.5 on the season…To complement his stellar effort, Guzman would also tack on his second sack of the season, and remarkably recorded yet another fumble recovery, making it two appearances in a row and three of his past four games that his alertness yielded a turnover. Having passed one immense test in the semis, the Knights defense will now face their greatest challenge in the finals when they square off with defending AA champs, Kellenberg Memorial…The owners of the #1 offensive in the entire NYCHFL (40.9 ppg), the Firebirds have run for 2,957 yards and 45 touchdowns in 2018….In the first meeting during week #3, the Xavier defense did a solid job holding KMHS to 20 yards on the ground (91 yards less than their seasonal average)…Guzman would make four tackles, including one for negative yardage on September 22nd. 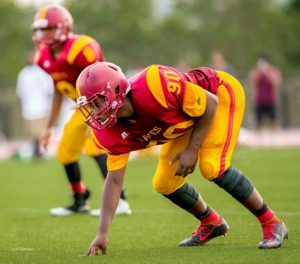 The captain, anchor, and heartbeat in the trenches for the defending AA champion Firebirds, there is not much, if anything, that occurs along the line of scrimmage that the two-year starter out of Island Park does not have an integral role in making happen. 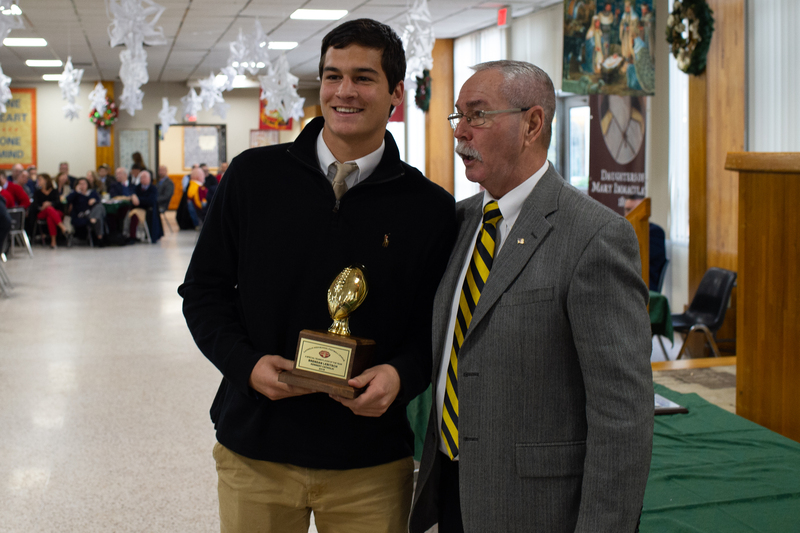 A force on both sides of the ball, at 6’4, 243-pounds, the KMHS 12th grader is difficult to miss on the sidelines because of his stature, but impossible to overlook on the field because of his skillful and often times dominant level of play. 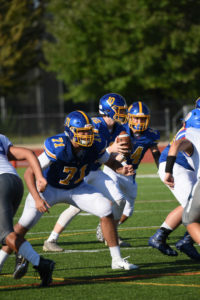 Forced to abandon the balanced offensive scheme they prefer due to excessive winds last Saturday night, Kellenberg would rely heavily on the ground game in their semifinal game against Fordham Prep. With 41 of their 46 offensive plans coming in the form of a run, much of the success enjoyed by the Blue and Gold in their 47-20 victory would be a byproduct of the spectacular performance put forth by Cipolla and his line mates…Running behind their stout right tackle, seven different KMHS student-athletes would take a turn at carrying the ball, as the Hanifan guided program established new season-highs for attempts (41), yardage (384), and touchdowns (7) in punching their own ticket back to championship weekend! 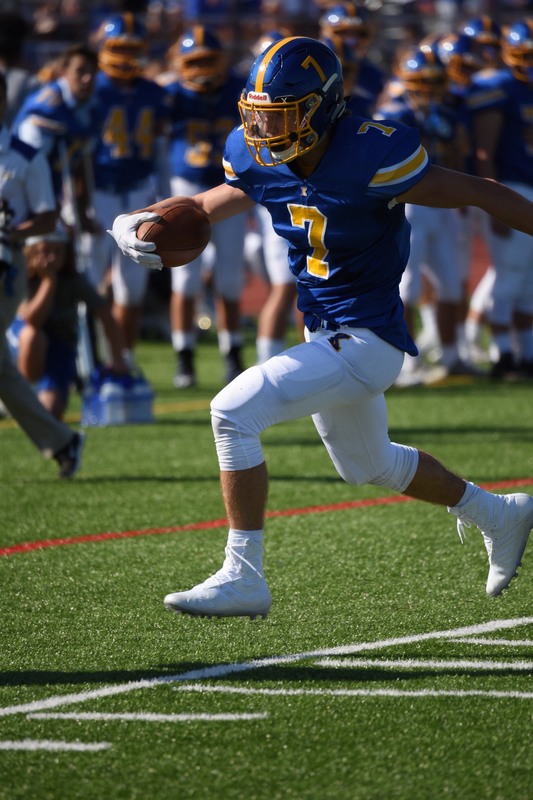 Led by the three touchdown apiece showings of Matt Sluka (77 yards on 16 carries) and Jordan Delucia (191 yards on 16 hand-offs), Kellenberg would find the end zone from distances of 21, 21, 42, 1, 41, and 8 yards out through the first three quarters…Well in control of the contest (up 40-14) at the time, Kellenberg added one final TD on the ground when senior, Nick Repoli, scored his first touchdown of the year on a 13-yarder early in the 4th quarter…While he did not score, another senior, Frankie Roder, contributed 66 yards on just three carries. Demonstrating that there is “no rest for the wicked,” to borrow from a Cage the Elephant tune, the honors student/Eucharistic Minister/Marianist mentor would play almost every snap of the game…Teaming up with fellow senior, Paul “PJ” McGuinness, Cipolla earned the praise of his head coach, who stated the following: “Our ends were flying off the edge in every pass situation, causing great discomfort to the always potent the Rams’ aerial attack.”…Recording one of his school’s six sacks on the night, #71 was consistently in the backfield, finishing the game with three stops in total, a caused fumble, countless QB hurries in helping Firebird Football Nation to their 21st consecutive win. With just one game remaining in his Kellenberg career, look for Cipolla to close out his scholastic career in fitting fashion. In the initial meetings with the Knights, as noted above, Xavier did do a fine job of slowing the running attack. However, Cipolla would provide excellent pass protection, giving Sluka all the time he needs en route to setting a career-high with 232 passing yards…On defense, he was a key part of a unit that limited the #3 rusher in the AA division, Dan Vittiburga, to his lowest output of 2018, as he gained just 59 yards on 16 carries. 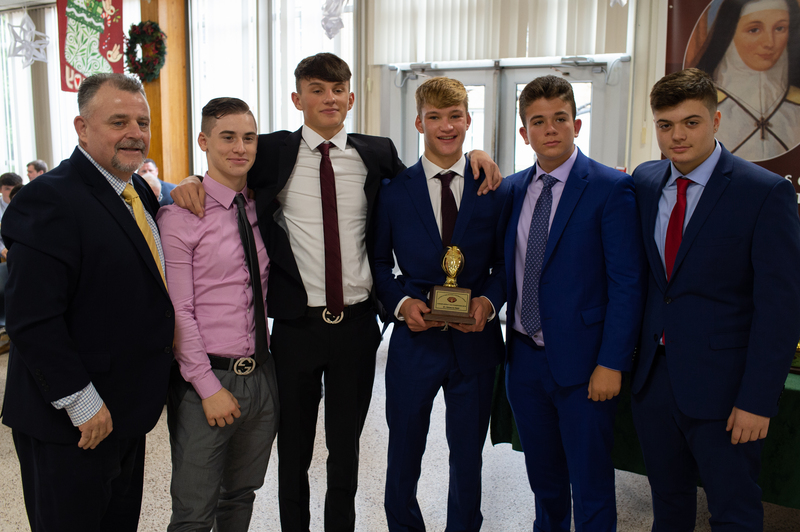 A team that on paper was never supposed to get this far in the triple-A playoffs, the CJ O’Neill guided Cardinals has emerged as the Cinderella story of the NYCHSFL postseason following a pair of victories over opponents who had previously defeated them during the regular season. Seeded 5th in the bracket with a 2-4 record, Cardinal Hayes would turn some heads and made a statement in the quarterfinal round when they transformed a 26-24 loss to Monsignor Farrell during week #4 into a 33-9 triumph two weeks ago…This past Friday, the Cardinals would do something that no other New York Catholic school had succeeded in doing since 2014; they went on the road to South Huntington to face top-seeded St. Anthony’s and walked away with a “w“ by a score of 26-25. This semifinal victory over the favored Friars came just four weeks removed from a 56-32 loss on the same field. So, what might you ask has been the catalyst behind this unforeseen rally to the AAA finals? One possible answer has been the growth of a defense that went from giving up nearly 38 points per game early on (1-3) to a unit that has surrendered an average of just 17 during the most recent four-week stretch (3-1)…But, another logical and valid explanation could be found in the person of the 5’9, 165-pound junior, Smith. The primary target of fellow junior/returning All-State QB, Sofian Massoud, in the aerial attack for much of the 2018 season, Smith entered the playoffs as the team’s leader in every major receiving category with 40 catches for 542 yards and seven touchdowns…And while he continued to be a steady presence in this aspect of the game (six snatches for 84 yards total in the postseason; 3 grabs for 36 yards specifically in the semifinals), what has really stood out about him of late has been his increased involvement within the Hayes rushing attack. Carrying the pigskin no more than three times in any game during the regular season, prior to the playoffs, #23 had a career-high of just 41 yards running, which he established during that week #6 defeat at the hands of St. Anthony’s….But alas, in the past two weeks alone, Smith has had his number called 23 times for a total of 214 yards, including his first two TD runs (one each week)…Barely missing his first 100-yard effort in the quarterfinals when he finished with 98 yards on seven attempts, Smith would easily surpass the milestone in the semis, as he accumulated 116 yards on 16 hand-offs (7.3/touch). With the Cardinals already leading 6-0 in the 1st quarter, Smith would showcase a level of field vision and elusiveness that you’d expect to only see from a polished running back, when he completed a Hayes drive in the last 3:00 of the opening quarter by traveling 21 yards on consecutive hand-offs to increase the lead to 12-0. 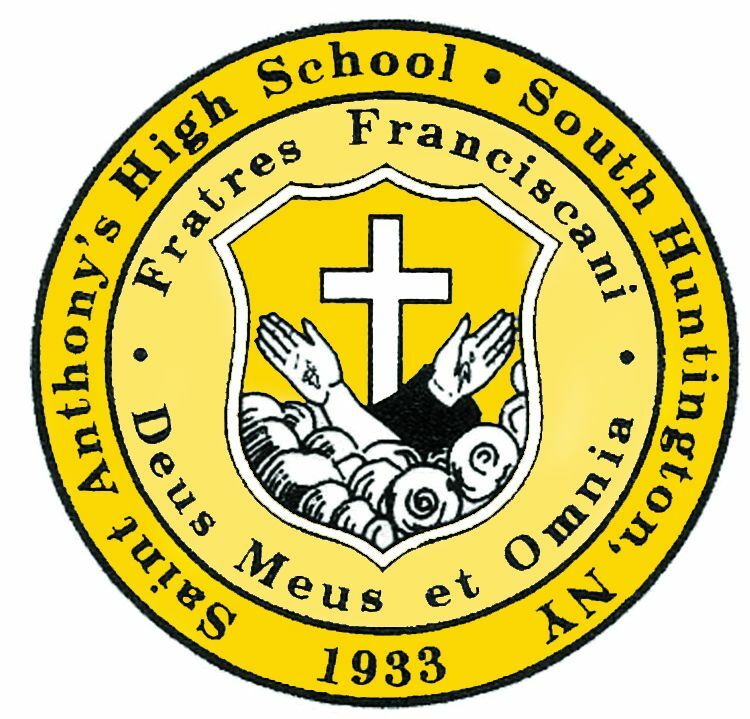 The TD run itself, which came from a distance of 12-yards was highlighted by the 11th grader dragging multiple Friars defenders with him as he muscled his way across the goal line…Massoud added the 2pt conversion on a QB keeper to up the advantage to 14-0. Now trailing 25-14 midway through the 3rd quarter, Smith would have a sizeable impact on the drive that awoke Hayes and put them back in the ballgame….Facing 3rd &4 on his own 14-yard-line, he would preserve the drive by being on the receiving end of a 17-yard screen pass…Moments later, with CH having moved to the opposing 30, he exploded for a 26-yard run to put the ball on the 4. Massoud did the rest, using a QB draw to cut the deficit to 25-20. Smith would again rise to the occasion on what would end up being the game-winning drive at the onset of the 4th quarter. Still down 25-20 on the scoreboard, he would catch a pass out of the backfield on 3rd & 6 (on the STA 31) and power/spin his way inside the red zone…Three snaps later, Massoud connected with Michael Escobar on a 14-yard TD strike to put Cardinals in the lead for good. 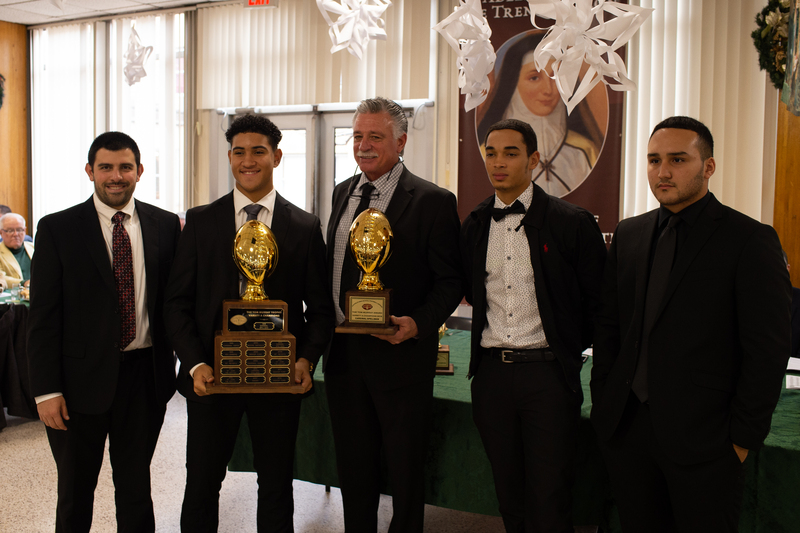 2-for-2 thus far in gaining vengeance, if Cardinal Hayes wants to hoist the hardware for the second time in the past three years, they will need for the glass slipper to fit one last time as they square off with Archbishop Stepinac in the title game…When the defending league/state champion Crusaders last saw Smith, he carried the ball three times for 16 yards and caught five passes for an additional 42 yards in the 23-20 loss in the regular season finale…But, as is clearly evident, there is no longer the same Cardinal Hayes program and it most certainly is not the same [Jalen] Smith. So, AS best take nothing for granted! 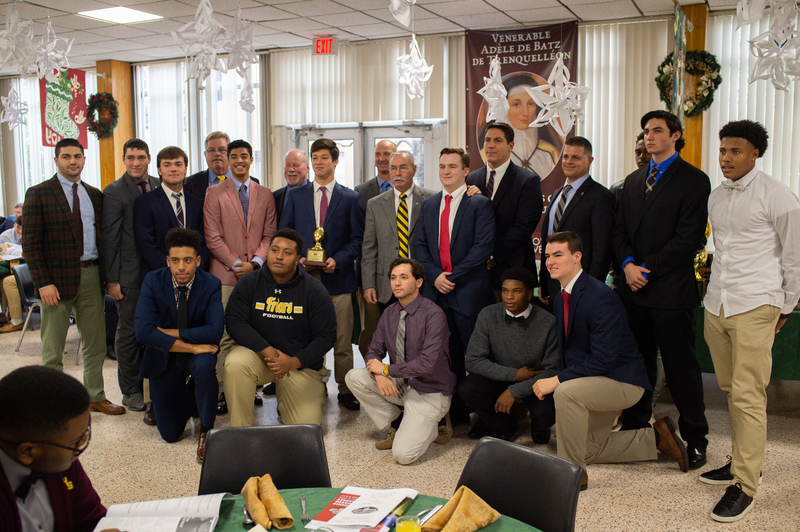 When previewing last weekend’s semifinal match-ups, we made it a point to mention that the absence of the senior running back from the Crusader line-up during the first meeting with Iona Prep was undeniably a game-changer…Hampered by injuries for much of the first half of the 2018 season, Grant would carry the ball just twice for a gain of eight yards in the 36-34 overtime loss on September 15th. What we did not realize (but perhaps should have because of his postseason reputation) is the extent to which the 5’10, 190-pounder from the Bronx would take over the game this past Saturday….A performance so electrifying, mind-blowing, and unprecedented, to call it a “career day” would be to fail to do it the justice that it warrants…Young Mr. Grant did not simply post a new personal-best for rushing yards; he created a standard and landmark that may never be approached, let alone equaled or surpassed by another NYCHSFL student-athlete. Exhibiting the caliber of leadership that you’d expect and demand to see out of a senior hungry to extend his scholastic career, Grant would have the kind of game that your grandkids will tell their grandkids about half a century from now. Carrying the ball 32 times (personal high), Grant would erupt for 405 yards (12.7/touch) and score three touchdowns (his first career 3 TD game) in sending the Crusaders to title weekend for the fifth straight year, following their 37-26 road victory over the Gaels….The inaugural member of the 400-yard club in the NYCHSFL, Grant did not just knock IP out of the 2018 postseason, he also removed one of their alumni from the annals of history, as his superhuman display shattered the previous record of 393 set by Jeffrey Mack in 2008. 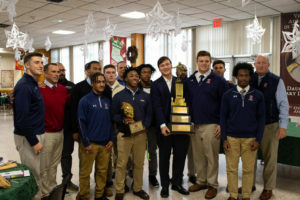 His team holding a 10-7 edge at the time, Grant made the first of his previously acknowledged three pilgrimages to the promised land with approximately 6:00 remaining in the 1st half, when he answered an Iona Prep touchdown by rocketing 65-yards up the middle on the first play of Stepinac’s ensuing position to make the score 16-7….Grant would add an additional two points to his team’s tally just before the intermission (13.8 ticks remaining) when following the second TD hook-up of the afternoon between senior WR Shawn Harris and junior signal caller, Joey Carino, he would find himself on the receiving end of a very unusual (pushed back due to penalties) 18-yard two-point conversion pass to make the score 24-7. The Crusader advantage trimmed to 24-14, the memories of Iona Prep rallying from a 14-point deficit in the 4th quarter of the first meeting would not be lost on Grant….Powerless to stop the momentum shift in September, he would show no mercy and take no chances last Saturday, punching in his second touchdown of the game on a 9-yard run with 3:33 remaining in the 3rd quarter to make the score 30-14. Unable to shake or break the spirits of the second-seeded Gaels for much of the day, it would be fitting that it was Grant who inflicted the death blow, as his third and final touchdown came with 8:20 remaining in regulation when on a 3rd & 4 inside the IP 5-yard line, he battled his way into the end zone to make the score 37-20. 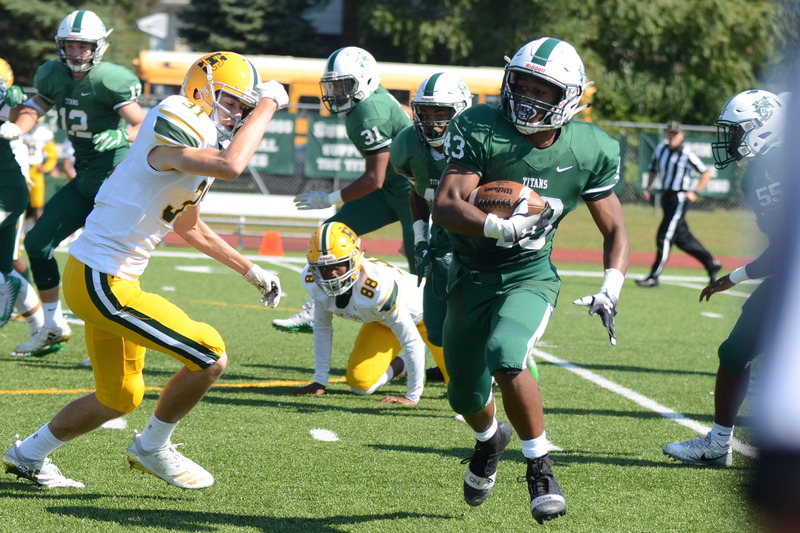 Grant, who dating back to last season’s state title victory over Canisius, has now rushed for 130, 170, and 405 yards (as well as six collective touchdowns) respectively in his last three playoff contests, should anticipate another heavy workload on November 17th….Rushing for 79 yards on 14 carries (his only sub-100 game since the end of September), but kept off the scoreboard in Stepinac’s 23-20 win over Cardinal Hayes in week #8, if one thing is guaranteed, it is that #4 in the red, white, and blue jersey is not going down (literally or figuratively) without a heck of a fight. 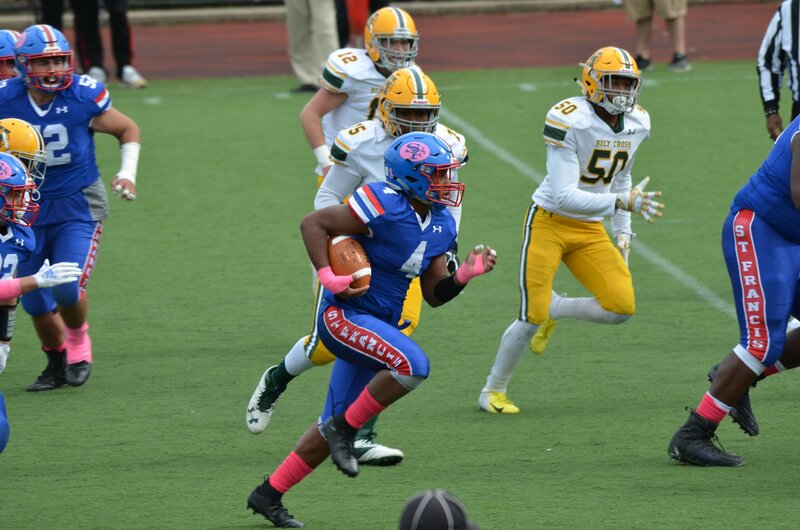 By virtue of Grant’s 400+ yard day in the semifinals, he will step onto Mitchel Field as the current #1 ranked rusher in all of the NYCHSFL. His 1,284 yards gives him a +48 lead over Kellenberg’s [Jordan] Delucia…So, with both studs playing for divisional crowns this weekend, the rushing race should make for an intriguing sidebar. Two years ago, the Monmouth University commit was a 190-pound sophomore who made just 13 catches for a Gael program that won the 2016 Double-A title…Fast-forward to the present time and what you now have is a 6’4, 235-pound stud who looks every bit the desired prototype for the tight end position…A testament to the amount of blood, sweat, and tears the Dobbs Ferry resident has sacrificed during the transformation process, it is not just Fleming’s physical traits that have grown; so too has his overall skill set and the level of impact he has been able to make as a part of this high-octane IP passing attack. 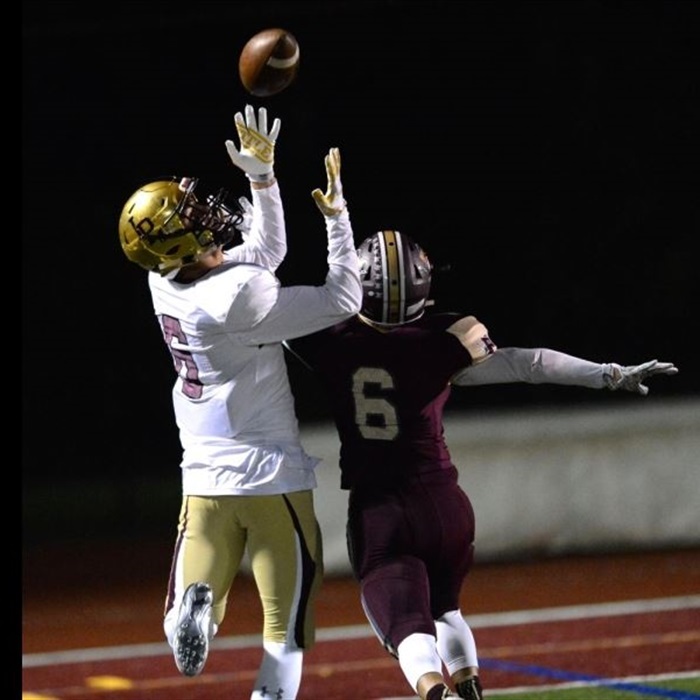 Taking to the field on Saturday evening needing just one reception to equal his 2017 season total, the Iona Prep captain would explode for nine catches for 71 yards (just eight yards short of tying his previous single-game best from last season) in propelling the host Gaels to a 42-21 victory in the quarterfinal round of the AAA playoffs…Among these nine grabs, three would result in IP touchdowns, giving Fleming the first three-score performance of his scholastic career. By virtue of his statistically best game in Maroon & Gold last weekend, Fleming has successfully surpassed all of his records from a season ago, as he now has 50 catches (42 in 2017) for 478 yards (463 last year) and seven touchdowns (6 as a junior)…His 50 catches currently ranks 2nd in the NYCHSFL (behind only teammate, Matthew Panker’s 55) and puts him in a tie for 11th overall for most catches this season in the entire Empire State. 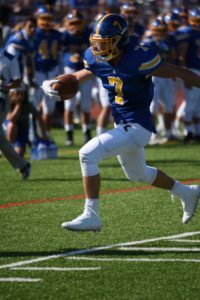 Fleming would catch his first TD of the game on his school’s opening possession of the game, capping off a sub-.2:00 drive by catching a 13-yard dart over the middle to give Iona Prep the initial 7-0 lead…He would add his second touchdown of the game late in the 3rd quarter when he caught a pass on 3rd & goal from the 7 and stretched across the line to make the score 28-14 in favor of the #2 seeds from New Rochelle….His third and final score came in the last 3:20 of regulation as again he made a grab short of the line and then dove his way in for a touchdown…Fleming also had a 2pt-conversion reception in the 2nd quarter to wrap up his night with an even 20 points. 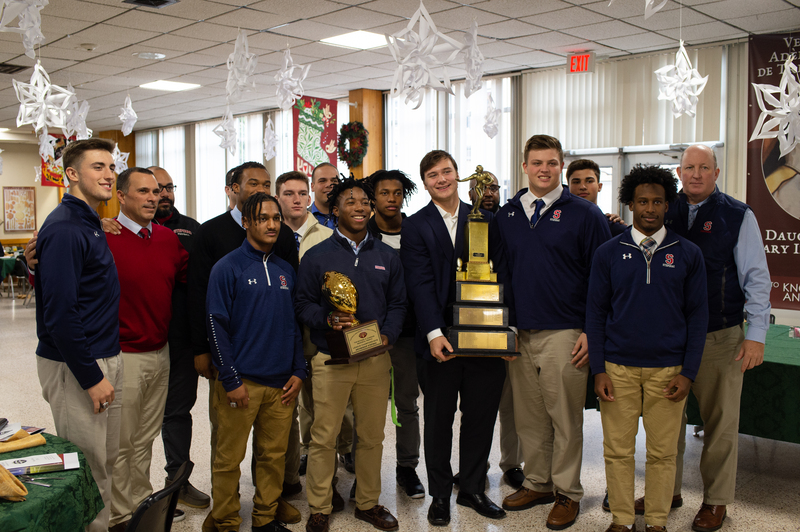 The Gaels will now host #3 seed, Stepinac in the AAA semifinals…When these two programs met during the regular season, it would be a late IP rally (trailed 28-14 in the 4th), coupled with a clutch stop on a two-point conversion attempt that yielded a 36-34 overtime victory over the defending State Champions….Fleming had five catches for 52 yards and one touchdown as a part of the win. It was an evening of redemption this past Saturday for Head Coach, CJ O’Neill, and the Cardinals of Cardinal Hayes High School….Just five weeks removed from witnessing their 11-point lead at the half get squandered in a 26-24 week #4 loss to the Lions, the boys from the Bronx could not have picked a more perfect moment to play their most complete game on both sides of the gridiron. 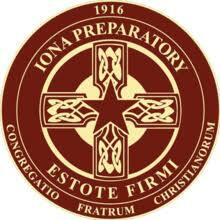 They advance to the semifinals for a fourth straight season behind a 33-9 triumph on the road over Monsignor Farrell. A defense that surrendered an average of over 30 points per game during the regular season, if you were to judge Hayes based solely on their performance during the quarterfinal round of the triple-A play-offs, you’d think they were the 1970s Steelers (Steel Curtin) based on how well their line executed in the trenches. Pitted against the regular season rushing king in the triple-A division, Vin Wagner, the Cardinals’ DL would hold the Farrell senior to his lowest production of the season (note: not including week #2 where an injury forced him out early), limiting him to a modest 77 yards on 16 carries…This strong performance up front marked a significant difference from the first meeting where Wagner rushed for over 200 yards. Starring in this statement-making effort for the Cardinals was the 6’0, 255-pounder out of the Big Apple…Credited with 11 total tackles, 2 TFL, and zero sacks heading into the postseason, Sherrod would be the best version of himself on November 2nd, making 8 stops (6 solo), including three for a loss of yardage, as well as earning a sack and three QB hurries. A lock to have been a POTW selection just on his defensive merits, Sherrod would not be content just dominating on one end of the line of scrimmage. 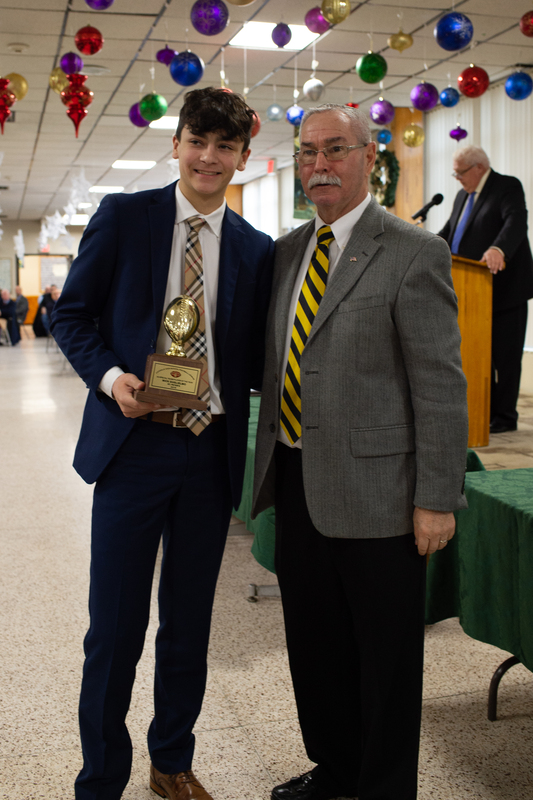 Instead, he would play almost every snap at left tackle, providing supreme protection to his returning All-State quarterback, Sofian Massoud, and making it possible for Hayes’ junior field general to complete 2/3 of his throw attempts (14-for-21) for 160 yards and three touchdowns. With one hurdle down, the 5th seeded Cardinals will now face a massive challenge in the semifinal round when they square off with top-seeded St. Anthony’s this Friday….56-32 losers when the two schools went head-to-head during week #6 (October 12th), Cardinal Hayes allowed 523 yards of total offense to the Friars. Hence, if they have any hope of making it 2-for-2 in avenging previous defeats, it will be necessary for Sherrod to pick up where he left off and continue to get the better of the exchanges in the war zone (line of scrimmage). 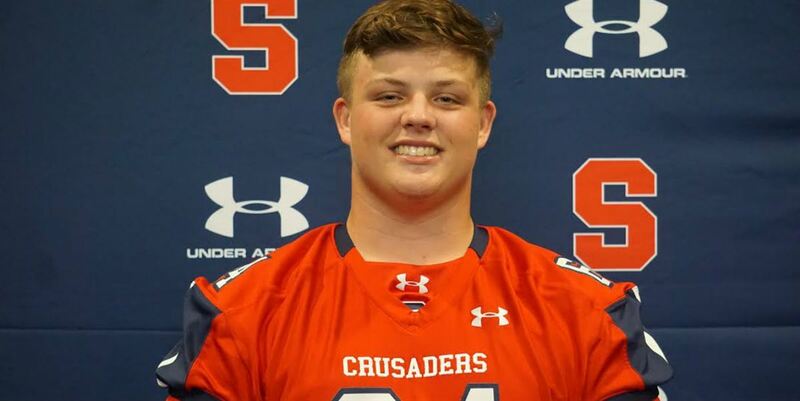 Staying on the topic of behemoth linemen who know a thing or two about what it means to be a bona fide monster in the trenches, for two-years, this 6’5, 297-pound beast has been a linchpin member of what we consider to be quite possibly the finest offensive line in New York State…. 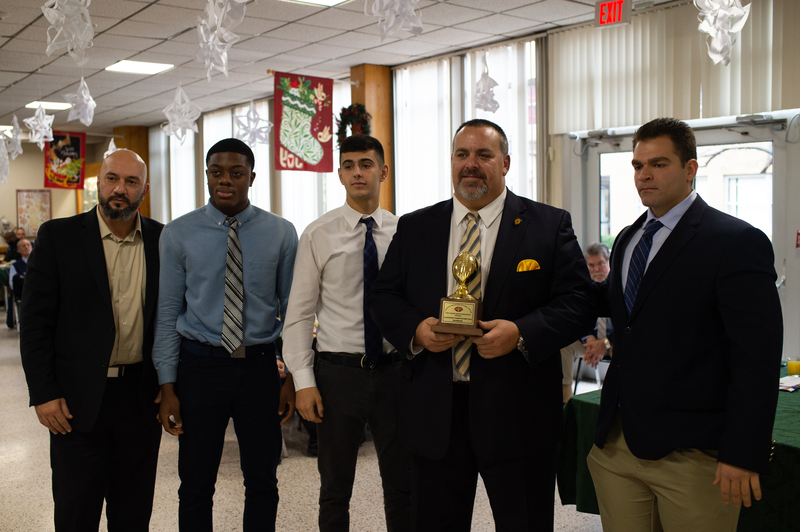 Such was the case this past Sunday, as Mike O’Donnell notched his 200th career win and his team took their first steps toward defending their league and state crowns when they defeated visiting Christ the King by a comfortable 51-13 margin. 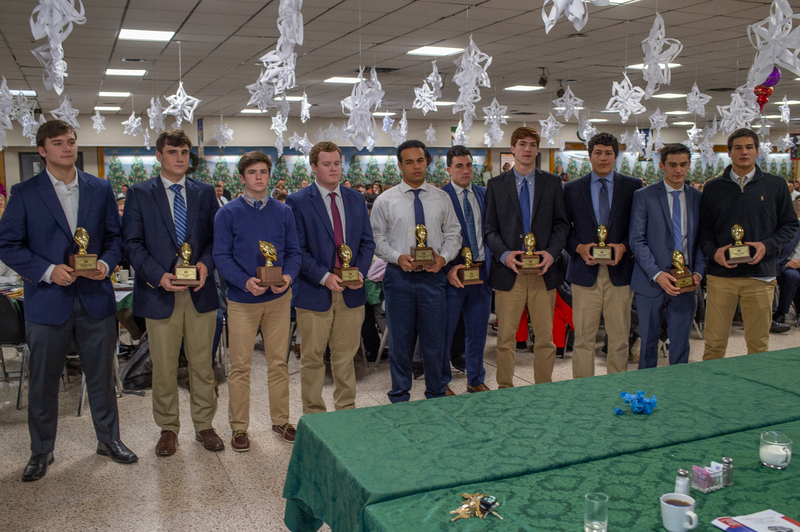 As a result of their unstoppable rushing attack on November 4th, the Crusaders have officially surpassed their running total from all of 2017, as they have improved from 2,218 yards (184.8 per game) a season ago to an astounding 2,296 yards (250.9/appearance) this year despite playing three fewer games…With #64 in red, white, and blue serving as their personal chaperon, three Crusaders (#1 Grant-879; #7 CJ Wise-486; and #9 Mekhi Green-376) currently rank in the top-10 in rushing yards this season in the triple-A division. 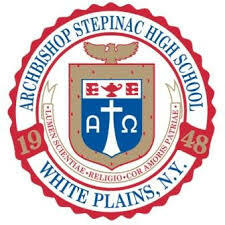 Stepinac will have the daunting task of trying to keep their repeat bid alive when they go into hostile territory to face the 2nd-seeded Iona Prep Gaels…And while the game of inches may have cost the Crusaders the opportunity for victory during the regular season, there is still much reason for optimism…Competing without the services of Grant for much of the contest, AS still managed to run for a season-high 369 yards and scored four TDs on the ground. 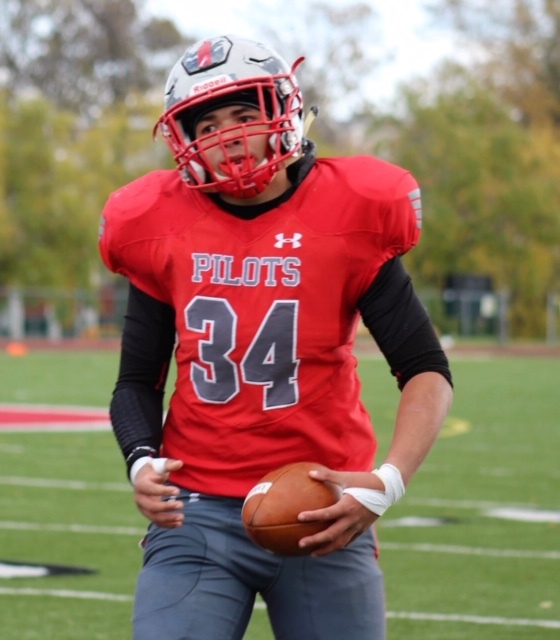 Mucciolo is committed to Sacred Heart University where he will join former NYCHSFL royalty, Randy Brito and Lucas Nunez (both of Cardinal Hayes), as well as St. Anthony’s alum Eli Terry, and Brendan Whitehead (Kellenberg) in suiting up for the Pioneers in the fall of 2019. 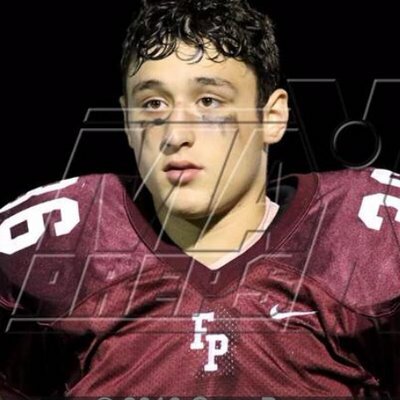 It is said that one spark is all that is needed in order to start a five-alarm blaze…For the 2017 Double-A runners-up, Fordham Prep, that flare would be delivered by senior wide-receiver/linebacker, Jack Goodkin, in the most unusual of ways during Saturday’s 39-12 quarterfinal win over St. John the Baptist. With the Rams trailing 6-3 in the second quarter, the visiting Cougars looked to have all of the momentum until the 5’11, 200-pounder from Briarcliff Manor instantly turned the tables by transforming a negative into a positive…Marching deep into SJB territory, Fordham Prep would have their drive prematurely ended on an interception. However, rather than accept the loss of possession, #36 would bolt like a bat out of hell, chasing down and stripping the Baptist defender to win back control of the pigskin. His hustle and grit would prove to be a catalyst as a few plays later, FP would take their first lead of the game (10-6) on a strike from senior QB, Derek Bufano to junior receiver, Owen Loffredo…This turnover into touchdown conversion would mark the beginning of a 36-0 unanswered streak as the #2 seeds out of the Western Conference never looked back again en route to securing a semifinal berth for the fourth time in the past five seasons (including a 2014 title journey in the “A” division). Speaking of the string of 36 consecutive points, Goodkin would not only be the motivating factor behind them, he also was a central figure during the rally, scoring on three of his six total catches to account for 18 points…A true Cougar killer, after previous personal best of 89 receiving yards and two touchdown receptions in last year’s game against this same foe, Goodkin would establish new career-highs in all receiving categories, finishing with 147 yards to go along with his aforementioned 6 grabs and three touchdowns. By virtue of his huge afternoon during the first round of the postseason, Goodkin has now taken over the team lead with seven TD receptions and has moved into second place for cumulative catches with 25 in 2018. 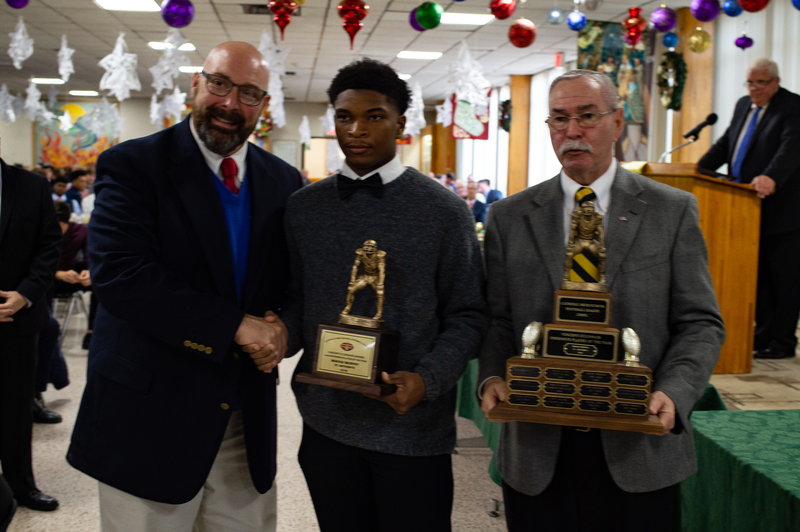 He added to his “outstanding game” to borrow the term used by FP Head Coach, Pat Deane, by contributing four tackles on defense. 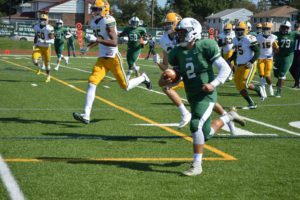 Goodkin and the Rams’ mission will be two-fold this weekend as they attempt to advance to title weekend in back-to-back seasons while also seeking revenge on the team who denied them the crown in 2017, Kellenberg Memorial. Playing in what was by far the best game of the opening weekend of the NYCHSFL playoffs, to say that Holy Trinity’s 27-26 victory over Moore Catholic went down to the wire would be an understatement. Entering the game with many of the pundits expecting to see an extremely run-heavy game plan (as we ourselves predicted in the quarterfinal preview), Rivers and the Titans would make us all eat a big bowl of crow this past Sunday…Tying their season-high in pass attempts with 15, the 5’10, 175-pound Westbury native had a sizeable hand in enabling his fellow senior, field general Ryan Razzano, to post a new 2018 best with 10 completions…On the back end of four of those double-digit connections, Rivers would increase his already team-leading pass catching numbers, as his four grabs for 59 yards and one TD would put his seasonal totals at 20 snatches for 289 yards and five scores. 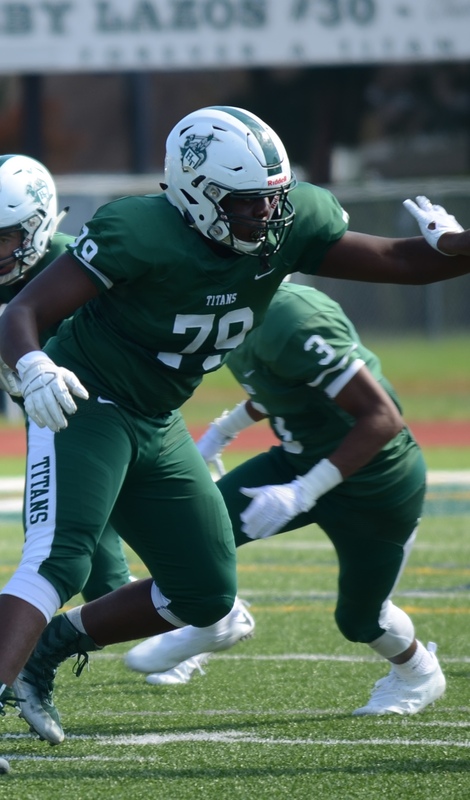 Getting the host Titans off to a great start, Rivers would be the recipient of the first of Razzano’s three touchdown passes, when he caught a 31-yard strike to give the Green & White the 7-0 advantage at the end of 12 minutes. Used as a spot ball carrier throughout the afternoon, Rivers would tack on an additional 17 yards rushing on five attempts to finish the game with an all-purpose total of 76 (his second highest total of 2018 if you exclude kick and punt returns). As solid a job as he did on offensive, what really set Rivers apart from many of his peers was the career-defining day he put forth on the other side of the ball…Known for his consistent tackling skills, #43 would establish individual highs in both total tackles and TFL, being credited with nine and three respectively. His nine stops led a HT defense that limited Moore Catholic’s star tailback, Justin Lacks, to a season-low, 61 yards on the ground. The 26 points scored by the Mavericks were also 11 less than the team average in games that Lacks played all 48 minutes. The #2 team in the Eastern Conference will now turn their attention to a semifinal showdown against Xavier (who they defeated 29-28 on October 13th)…In the first meeting between the Titan and the Knights, Rivers would catch a four-yard TD pass for his lone reception of the game; he also added 18 ground yards, as well as five tackles and a sack on defense. “Offense fills the seats, but defense wins championships.” These were the words expressed by Knights Head Coach, Chris Stevens, following Xavier’s 27-0 blanking of Xaverian last Sunday night in the NYCHSFL Double-A play-offs…Seeded 3rd in the east, the shutout over the Western Conference champ Clippers makes it three years in a row that the Maroon & Blue platoon has gone on the road and knocked off higher placing opponents in the first round of the postseason. 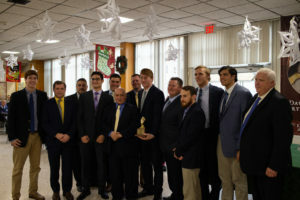 Known for their long history of posting goose-eggs on defense, because this year’s Xavier squad is the school’s most offensively gifted since the 2012 season (averaged 28 ppg during the regular season), more times than deserved, the “D” has gotten the short end of the stick when it comes to handing out praise…However, true to the tradition and consistent with what you would demand and/or expect to see out of a Stevens’ mentored group, as the games have taken on greater importance, the defense has responded by turning up the intensity…Unscored upon in their past eight quarters of work, the West 16th Street posse has been unforgiving, unrelenting, and punishing down the stretch…And at the heart of it has been their 5’10, 180-pound power backer [Gwardyak]. 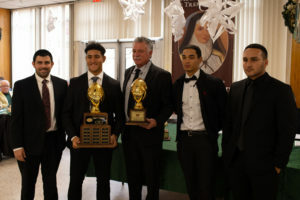 The reigning Defensive Player of the Year for the Knights after leading the team in stops with 79 (including 8 TFL) as a junior in 2017, the Staten Island resident has not shown a hint of slowing down in his final season as a Xavier student-athlete…Sitting in the familiar spot atop the team leaderboard with 51 tackles during the regular season, Gwardyak’s effort this past weekend would only pad his cushion, as he posted a season-best 11 stops (5 solo, 6 assisted), while tacking on his first full sack of the season and adding a pass deflection for good measure in holding the opponent to under 200 yards of total offense. He has now reached double-digit stops in consecutive games after putting up a 10-tackle game in the season finale versus St. Francis Prep. However, while we would never deny the impressiveness of his stat line, much like Goodkin above, it was not just the quantity of his numbers that won us over; it was also the quality and intangibles attached to his output that made the greatest impression…And, identical to the aforementioned Ram, it was a forced fumble by Gwardyak that ultimately served as a game-changer…With Xavier clinging to a 7-0 edge in the 3rd quarter, the Clippers would mount a potential game-tying drive, advancing the ball to midfield. But alas, that attempt at squaring up the score would meet a premature demise as #44 would jar the ball loose and return it to the opposing 33…A few plays later, Dan Vittiburga would punch in his second TD of the game to double the lead to 14-0…The Knights would never look back, as the turnover ignited a 21-0 streak to end the game. Riding the wave of confidence that results from holding a former NYCHSFL Offensive Player of the Year [Roberto Auguste] to a meager 29 yards on the ground in the first round of the playoffs, Gwardyak knows that the challenges will not get any easier in the semis, as he will be tasked with containing a Holy Trinity rushing attack that has accumulated 2,248 yards and 32 touchdowns in 2018….When these two schools played on October 13th, the Titans gained 259 yards and scored three touchdowns in emerging with the 29-28 victory…And while Gwardyak (9 total tackles; season-best 3 TFL) would perform well individually in the losing effort, he knows that it will be his responsibility to elevate the entire team if they hope to return to AA title game for the first time since winning it all in 2015. This past Saturday, the 6’3, 205-pound red-headed assassin [Sluka] made sure that the rematch would be a lot less dramatic, as he accounted for five touchdowns (four rushing, 1 passing) in improving his career record on the varsity level to 20-0 behind the 48-14 victory. An absolute phenom who may deserve to have his #10 jersey retired the moment the clock hits 0:00 in his final game for the Blue & Gold, what is heavenly about a player like the Roslyn native is that as dominant as he is during the regular season (and trust us, he is plenty dominant; 1,786 yards of total offense/23 total touchdowns), he seems to possess the uncanny ability to find an entirely new gear once the postseason rolls around. It is as if the first eight weeks of the year are a mere warm-up act and the playoffs is the featured attraction. 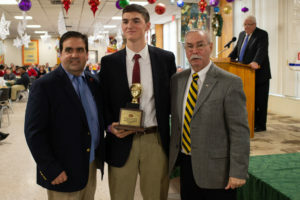 Scoring 10 total touchdowns (an average of 3.3) in last year’s three-game trek to Titletown, Sluka would post a career-high six total touchdowns (5 rushing + 1 passing) in the finals victory over Fordham Prep to earn Offensive MVP honors…Using last year’s championship weekend effort as proof that he is an individual who is known to perform his best the higher the stakes, if five touchdowns in the quarterfinals on November 3rd is the starting point for Sluka this postseason, one can only imagine what he has instore for the crowd during the next two weeks (should KMHS return to the ‘ship). Carrying the ball 14 times for 140 yards and the previously cited four touchdowns last Saturday, Sluka needs just 55 yards rushing during the semifinal round to earn his second 1,000-yard season in as many tries. The two-year starter under center would break the ice quickly in the first quarter, scoring on an 8-yard dash to give KMHS the early 7-0 advantage…Following an Eagles’ score to knot the game at 7 apiece, Sluka would notch his second TD of the opening 12 minutes when he took the keeper up the middle and then cut to the outside to run 60-yards down the near sideline to make the score 14-7….Now leading 21-7, Sluka would record his third rushing TD of the game on Kellenberg’s initial drive of the second half, shedding several tacklers and spinning into the end zone from 6-yards out to make the score 28-7…The quattro would come with 6:30 remaining in the 3rd quarter when Sluka capitalized off of a St. Peter’s turnover (fumble caused by Jake Deakin, recovered by Alain Telfort) by hitting Bobby Filshie with a 24-yard strike over the middle to move the ball to the 16-yard line and then took it the rest of the way on the next play via QB keeper…As a cherry on top, Sluka (6-for-9 passing; 88 throwing yards) would side-step a pursuing defender and toss a perfect 24-yard pass into the back of the end zone to find Frankie Roder to make the score 41-14 in the last minute of the 3rd. 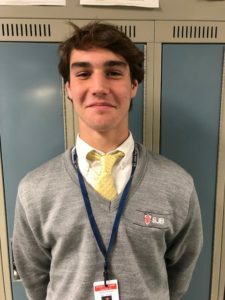 Sluka and the ‘Birds will now prepare themselves for a semifinal showdown against a very familiar foe in Fordham Prep….A perfect 3-0 in his scholastic career against the Rams, we already told you about his title-game brilliance from last November. 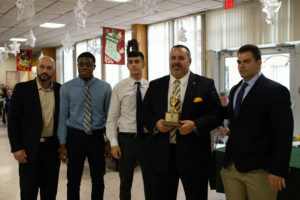 However, it should be noted that in two regular season meetings (including the 2018 finale on October 26th), the reigning 2nd-team All-State selection has been lights out, rushing for a career-best 244 yards and three TDs last season and then flipping the script two weeks ago by connecting on 6-of-8 attempts for 121 yards and three touchdowns in the air (also ran for 64 yards and 1 TD)…So, with 13 overall TDs (9 rushing, 4 throwing) among three head-to-head match-ups, there is no situation in which FP can and/or should feel safe. In his hit song, “I do Everything”, Jamaican R&B recording artist, Masego, talks about all of the things he can do…Well, with all respect due to this gentleman, kindly “hold Joe Randazzo’s ‘Root” Beer’.”…Because when you look at all that the 6’1, 230-pound senior out of Staten Island did this past Sunday in helping the Mavericks snap a two-game losing streak (63-22 over St. Joe’s by the Sea), you see that in comparison, you did not really do much after all. Already a rather busy guy while tending to the defensive (LB) and specials teams (serves as both the place-kicker and punter) duties, Ranzazzo has seen his activity level increased even further during the past three weeks of the regular season, as injuries in the offensive backfield have forced him to embrace a new role…And whereas in weeks 6 and 7, the need was for him to serve as a ball carrier (15 carries for 70 yards, 1 TD between the two games), the 2018 finale would call for him to be more of a battering ram…And, like you would expect to see out of any senior at this time of the year, Randazzo did not disappoint in this selfless role, as it was his repeated “crushing blocks” to quote Head Coach, Nick Giannatasio, from the H-Back position that paved the way for the Mav’s three thoroughbreds—Justin Lacks (13 carries, 155-yards, 3 TDS), Mausari Miller (9 carries, 121 yards, 3 touchdowns), and Dashawn Lawton (2 hand-offs for 23 yards + 1 score) to combine for a total of 299 rushing yards and seven touchdowns in just 24 minutes to give MC the 50-16 lead at the intermission. Not satisfied with allowing his teammates to have all of the fun and hog the box score, Randazzo himself would account for seven points of his own, as he ran in a pair of two-point conversions, completed a pass for another 2-pointer, and then connected on 1 of his 2 PAT attempts. 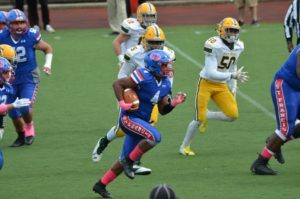 The defensive side of the ball would also treat the 12th grader well, as one week after establishing it, he would equal his career-high for tackles with 10 (5 solo, 5 assisted), including one stop for negative yardage. He would also be credited with creating his second turnover of the season when one of his double-digit pops resulted in a caused fumble…Again, these feats were accomplished in just one half of playing time. Randazzo rounded out his week 8 smorgasbord of assignments by averaging 33.3 yards on his seven kick-off attempts. Finishing 3rd in the Western Conference, the Mavericks will be on the road for the Double-A quarterfinals when they face #2 seed in the East, Holy Trinity….With both programs emphasizing a smash mouth brand of football, it would be logical that between blocking on “O” and chasing down Titan ball carriers on “D”, this weekend will not be any more relaxing for the Moore Catholic captain/Honor Student. In the legal profession, there is a saying that “possession is 90 percent of the law.”..For the Eagles football team, that statement could be amended to say that 90 percent possession is their law…And given the rare talents of their senior kicker out of Staten Island, you can best belief that St. Peter’s has and will continue to manipulate times of possession as they see fit. A master of what Eagles’ head coach, George Mahoney, calls “nasty kick-offs”, on more than a few occasions this season, the 5’11, 160-pound specialist has made it possible to play the football equivalent of “make it, then take it”, by producing some of the most un-fieldable kicks in the history of the sport…And, when you are playing an opponent that has lightning speed and big-play potential on every snap, as was the case last Friday night when STP faced-off with Mount St. Michael Academy, then the best defense is to not needing any defense at all!!! Securing a playoff berth (4th in the AA Western Conference) by virtue of the 42-18 road victory in the regular season finale, the Eagles successfully stole two possessions thanks to Guglielmo’s wicked onside kicks….And, this additional opportunity would yield an offensive explosion as St. Peter’s posted their second highest point total of the season (topped only by a 49-14 win over St. Joe’s by the Sea during week #2). Adding to Guglielmo’s growing reputation is that even in situations where he did not specifically seek out an onside attempt, he still enjoyed a 100 percent efficiency rate in negating the potent Mountaineer return game. On his four remaining kickoffs, one was a boomer through the back of the end zone that led to a touchback. The other three had so much spin and pace on them that MSMA were unable to handle them smoothly and were instead forced to pounce on the pigskin rather than attempt a run back. Not just a one-trick pony, it bears mentioning that when utilized in traditional fashion, Guglielmo would also excel, as he converted on all six of his point after touchdown attempts, dissecting the goalpost with each try. As St. Peter’s prepares themselves for their quarterfinal showdown with defending league champs/owners of the #2 overall offense in the entire NYCHSFL, Kellenberg Memorial, you know that Guglielmo’s wizardry will be a factor. 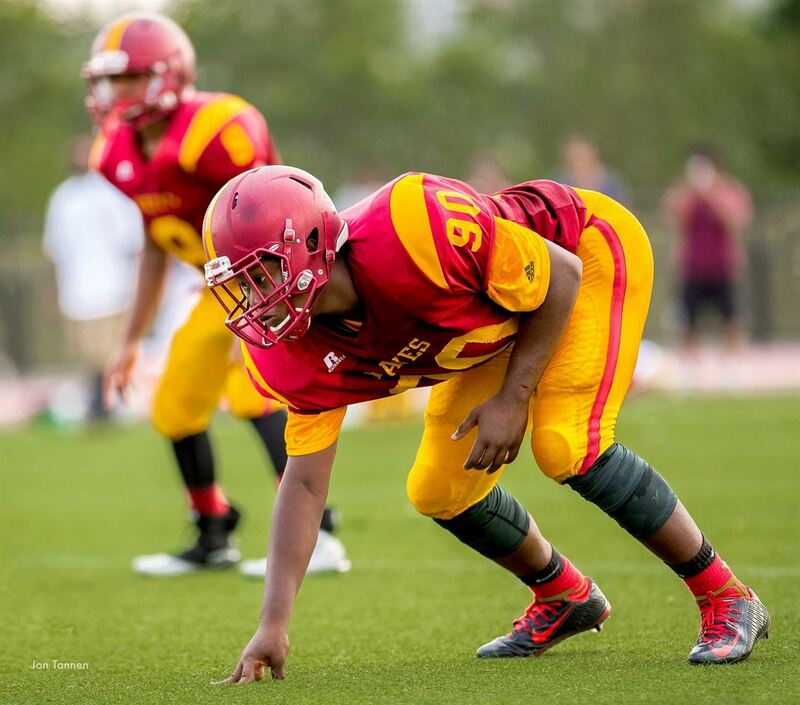 While this week may all be about Halloween, the plight that any younger brother faces when strapping on the pads is whether or not he will live up to the family name and earn the right to sit at the “adult table” during Thanksgiving….Further complicating the situation for the 5’10, 185-pound junior is that he entered the 2018 season with the misfortune of playing the same position as a sibling who garnered All-City Honorable Mention distinction in 2017. However, if the past three weeks have been any indication of what the rest of his scholastic career will resemble, then there is absolutely no doubt that Matt Geruso is well on his way to filling the cleats of older, brother Jonathon (1,460 yards + 14 touchdowns last season the ground), in the Knights’ offensive backfield. 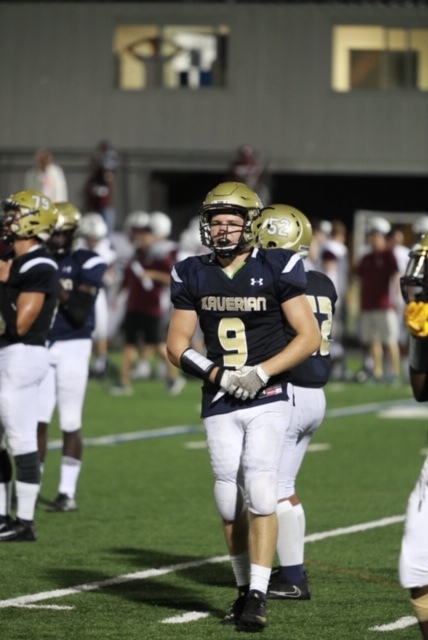 A key component to Xavier’s title-winning season last year on the junior varsity level, what stands out about Geruso 2.0 is that the bigger the game, the more he seems to show up. This ability to rise when circumstance warrants is one that cannot be taught; it is a gift with which you are blessed and for Head Coach, Chris Stevens, the church of #8 is one that he will worship at for the next year and a half. tively)….But, despite having to split carries, he has still managed to have an incredible 11th grade campaign, as his 586 yards on the ground ranks in the top-10 of the double-A division….And, at the level he has been playing at down the stretch, should Xavier make a deep run in the playoffs, there is every reason to believe that he could reach the 1,000 yard milestone. Establishing a new personal-best of 157 yards (on only eight carries), including a 45-yard trek (that made the score 28-0) to the house in the Knights’ 40-0 win over St. Francis Prep, Geruso has now hit the century mark in three consecutive game, as he previously tallied 125 against Holy Trinity on October 13th and followed it up with a 104-yard, career-high two TD affair the following weekend versus Mount St. Michael Academy….With an average of just under 129 yards on running during this three-week period, it goes without saying that at present, Geruso, is operating on par with any and all of the top performers in the NYCHSFL. When not the one to carry the ball, Geruso is still making invaluable contributions, as Coach Stevens was quick to credit his strong acts as a lead-blocker as another reason that Xavier’s point production is skyrocketing at the ideal time. 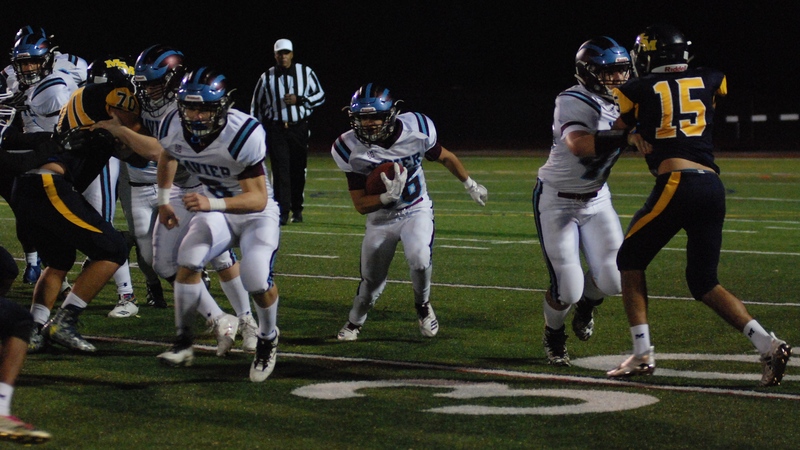 The Knights will kick off the postseason with a date on the road against Western Conference regular season champions, Xaverian…Since week #6, the host Clippers are allowing just 11.3 points per game. Hence, if upset-minded Xavier intends to make it three years in a row that they knocked off a higher seed in the opening round, they will need Geruso to continue his trend of being that proverbial dominant 1-2 punch alongside Vittaburga. If both play up to their abilities, Xavier has to like their chances. Competing in a preview of what will be this weekend’s #2 vs. #7 quarterfinal match-up in the Triple-A playoffs, the 5’9, 175-pounder out of Mount Vernon showed that the Flyers of Chaminade High School will have another in an already long line of Gael threats with which they will have to contend. A member of an offensive rotation that is so deep and strong that he perhaps has not had the quantity of looks that he would have received at another program, Lambert would demonstrate this past Saturday that it does not matter if you get four or 40 touches as long as you make each one count to the fullest. Carrying the ball a season-high four times in Iona Prep’s 47-14 road win over their Marianist foes this past Sunday, Lambert came within six yards (71) of tying his career-best, which he established late in the 2017 season by running for 77 yards and four TDs in a win over Monsignor Farrell…The senior classman would also add a pair of touchdowns on his limited carries to notch his first multi-score game since the aforementioned coming out party last season against the Lions. 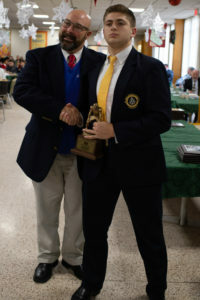 The two-year team member/2018 captain would also turn in a remarkable game on the other side of the ball, as his interception, one of two on the day for IP collectively, would give possession back to the Gaels, ultimately serving as a catalyst to another score…He would add seven tackles, and was personally responsible for keeping a point off the board when he blocked the PAT attempt following one of the Flyers’ two touchdowns. Having already proven that he enjoys a speed mismatch against the Flyer defense, do not be surprised if this Saturday has feelings of déjà vu and the two-season track star continues to be a threat to rip off big runs. The POTW selection is the second accolade of the week earned by Lambert. Yesterday, he was named as his school’s student-athlete of the week in acknowledgement of his full-service afternoon. Like a volcano sitting dormant, it was never a question or if, but rather when the 6’0, 211-pound senior would erupt. And when it happened, those of us who have been watching him the past three seasons knew that it would be explosive and it would leave a “trail of lava and ash” in its wake. 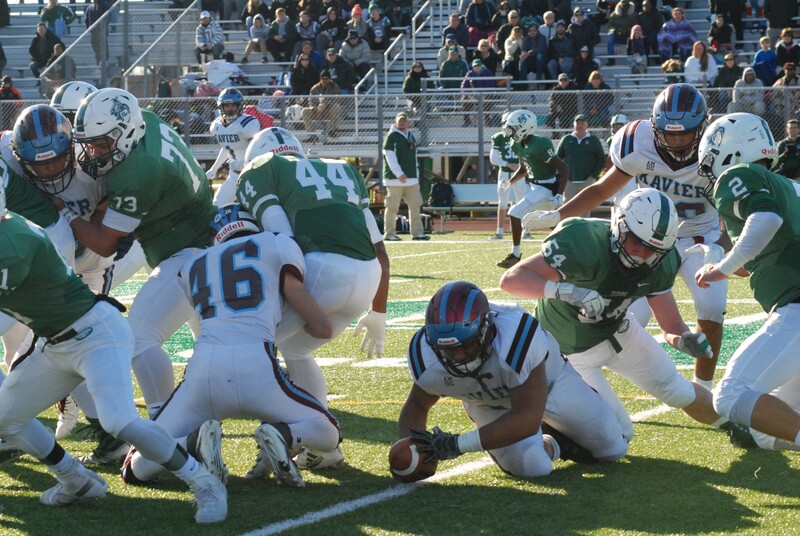 Entering the final week of the 2018 regular season with just six sacks following a junior campaign that witnessed him lead all of New York State with 18 QB bags, the fuse would go off for Simmons. And when it sparked, it ignited what was perhaps the best overall showing by Head Coach, Mike O’Donnell’s defense this season, as they emerged, 23-20 over Cardinal Hayes….As a result of the victory, the once given up for dead Crusaders (started the year 0-3 in league competition) have now worked their way back to a top-3 seed and will host Christ the King in a AAA quarterfinal round contest. Relentless all night in their pursuit of Cardinals’ All-State signal caller, Sofian Massoud, Stepinac D-Unit would log double-digit sacks, as four different members of the front-7 would each post two or more bags during the course of the 48-minute clash…Headlining this quartet would be Simmons, whose four-sack effort tied his previous career-head which he set during the first weekend of the 2017 season. He would add three additional QB hurries last Sunday night to ensure that the only ghosts that haunt the Hayes’ field general this week were the memories of his [Simmons] #56 jersey inflicting hit upon hit. 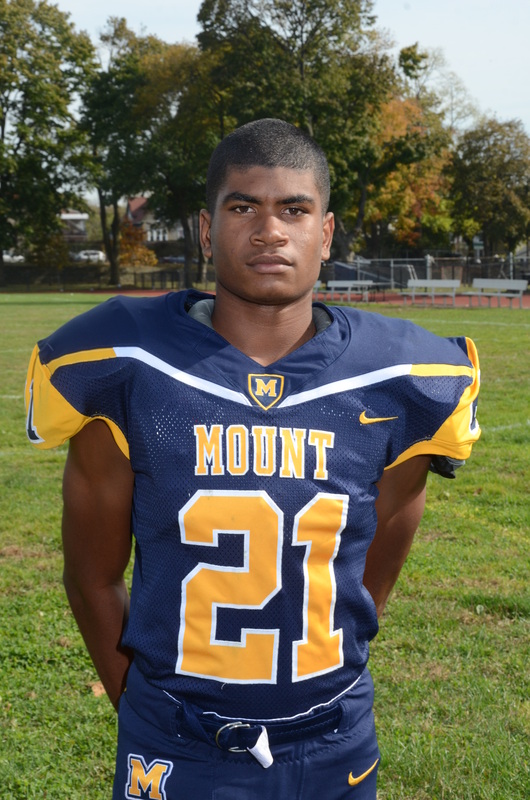 Two weeks removed from establishing a personal-high for total tackles in a single-game (12) in the 35-17 win over Monsignor Farrell, Simmons would break that record by recording 13 stops in the season finale. The 20 put on the board by Cardinal Hayes was their lowest amount of the season. 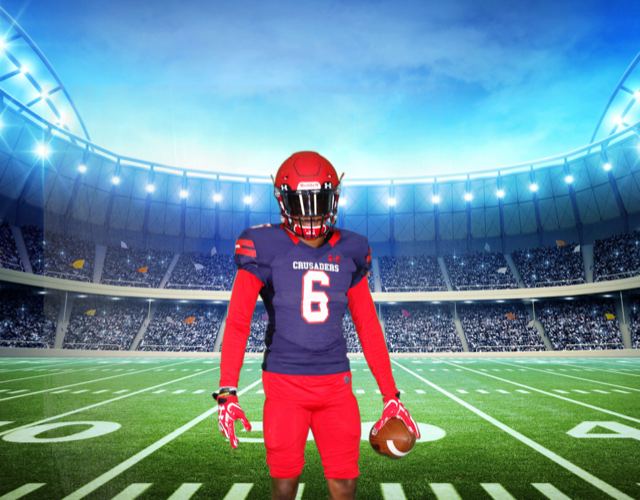 In fact, dating back to the semifinal round of the 2017 season (13-12 Stepinac triumph), Stepinac has now limited the always dynamic Cardinal offense to their two fewest point totals in the past calendar year. 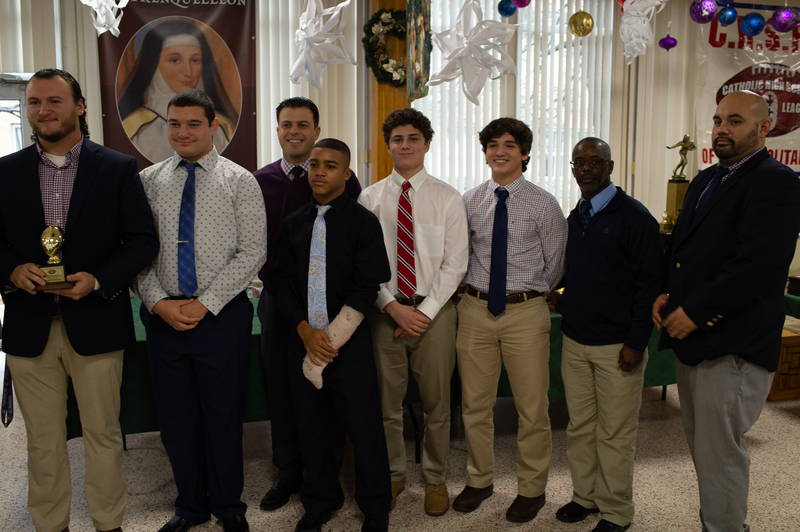 Batman and Robin; Abbot and Costello; Peanut butter & Jelly; and for you “Maneaters” out there, Hall and Oates….Throughout time and in every walk of life, we have been blessed by the greatness of many dynamic duos…And in 2018, the NYCHSFL gave birth to another terrific tandem in the persons of Kennedy Catholic running backs, Myles Proctor and Seth Surrett. 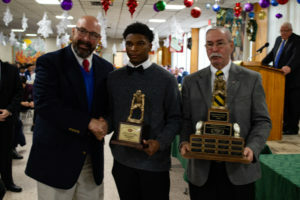 The #1 and #2 ranked men in every rushing category this season in the “A” division, Proctor (823 yards, 5 TDs) and Surrett (573 yards and 8 touchdowns) have taken a Kennedy Catholic program that had never advanced to championship weekend and turned them into a program that is now not only a heavy favorite to hoist hardware next month, but also a team that is so good it can now challenge and defeat opponents from the higher divisions….Last Friday, history would be achieved when the Gaels upended St. Joseph’s by the Sea in overtime, 37-34. It marked the first time in school history that KC had bested a double-A foe. And, as they have been every step of the way during this remarkable 6-1 season in Somers, NY, this unstoppable tag team would again be the difference makers, combining to trek for 220 yards and score three touchdowns. 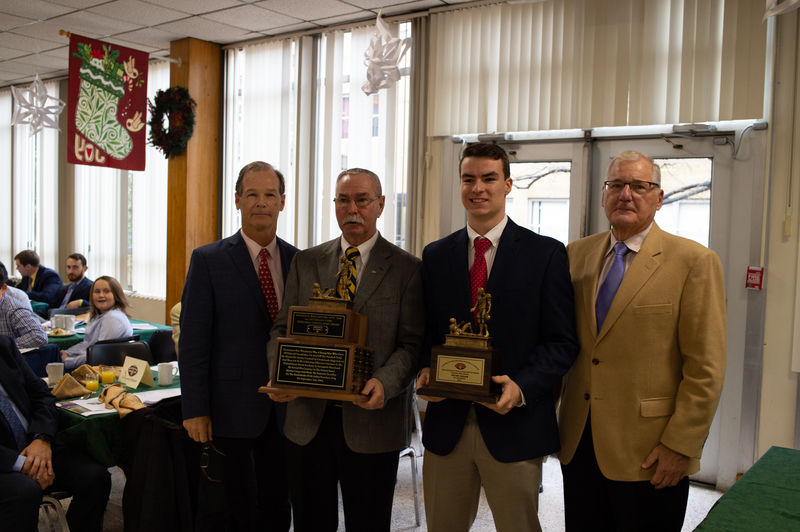 Proctor (previously selected during week #3) joins Surrett (weeks 1 and 4) as one of the rare multiple-time honorees thus far in 2018. However, in a year where he was been incredibly consistent and electrifying, to say that week #7 was his finest showing of the season is to say that he reached the peak of Mount St. Elias after already touching upon Mount Whitney, Mount Herard, and the Rio Grande Pyramid….And the only reason we did not say Denali is that we think he might have it in him to reach even higher heights before he hangs up the pads. Running for 100+ yards for the fifth time this season (his lowest total came during the first week of the season when he “settled” for 96), Proctor would carry the ball 27 times, gaining 165 yards and setting a new career-high with two rushing touchdowns in the “w” over the Vikings…His first TD came on the Gaels’ initial possession of the game, when after his team recovered an onside kick, he punched the ball in from short distance to give them the early lead. Finishing the night with a personal best 225 yards of total offensive output, the 6’1, 205-pounder also showcased his potential as a receiver out of the backfield. Not utilized much in the past in this regard, the Yorktown Heights resident caught a pair of balls for 60 yards, including a 20-yarder off of a screen pass that gave him three TDs overall and tied the game with 1:50 remaining…His second reception, a 40-yarder, would not result in a TD, but was the key play in a subsequent drive that would again even the score with 50 ticks still on the clock. Making the Energizer bunny look lazy, Proctor would also contribute mightily on the defensive side of the ball. Rotating between linebacker and cornerback, he was credited with his second straight double-digit tackle effort, making a career-high 12 stops (3 solo; 2 TFL) and also having a successful pass break-up. 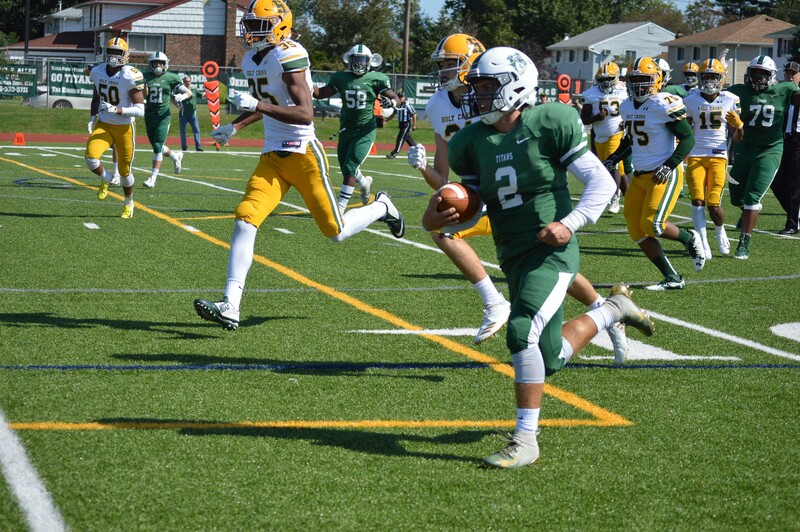 Note: At the time of publication, Proctor was also vying for LoHud Player of the Week honors. Speaking of special individuals who are no longer strangers to this list, the Xavier senior running back is now 2-for-2 in being named as Xavier’s representative this season. First recognized during the second week of the regular season when he had a 24 carry, 160-yard, two touchdown game in a victory over St. John the Baptist, the 5’8, 165-pound 12th grader makes his return to the POTW scrolls this week after shattering all of the records he set in that aforementioned triumph over the Cougars. 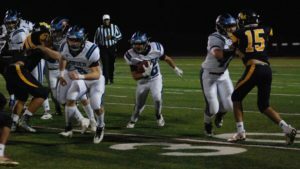 Needing only a matter of seconds before getting the Knights on the board, Vittiburga would field the opening kickoff and run it back 91 yards to the house to quickly put Xavier ahead 7-0 over Mount St. Michael Academy. A definite sign/foreshadow of what the rest of the evening would deliver, special teams was not the only element of the game in which the Brooklyn boy would look invincible. To put it bluntly, every time he touched the ball, something amazing seemed to happen. Three of his 21 total carries would yield touchdowns and a fourth big gainer (that went for 61 yards) would be the catalyst for an additional Xavier score en route to the 48-27 win on the road. Finding himself in the midst of a touchdown tear the past three weeks, with all respect to former Yankee icon, Reggie Jackson, it is the young Mr. Vittiburga who is the new “Mr. October.”…Since the start of the month, he has posted no fewer than two TDs in any game, and has combined for seven total touchdowns in the past two weeks alone. His eight rushing TDs during this stretch gives him 12 on the year, which ranks ties him for 2nd in both “AA” and the NYCHFL as a whole…The career-high 230 yards he racked up during week #7 gives him 444 during the month and 832 for the year (3rd best in Double-A; 4th best among all Catholic ball carriers). His team already leading 7-0 thanks to his KO heroics, Vittiburga would double their lead in the 1st quarter when he exploded for 48 yards on the first of his three cited TD dashes…He later added touchdown runs of 10 and 38 yards in the 2nd and 3rd quarters to account for the final 12 of his 24-point showing. 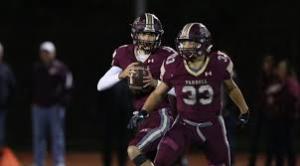 Owners of a 2-2 league record (4-3 overall), the Knights will look to lock down the #3 spot in the Eastern Conference when they face St. Francis Prep in what will be last regular season game that Vittiburga will play in front of the home crowd…The Terriers are fresh off of a game where they allowed 347 yards and four touchdowns on the ground. Hence, Vittiburga and the Knights could be licking their chops at the prospects of what could materialize on October 27th. If friendship truly consists of a million little things, then the art of winning on the gridiron must be comprised of one million and one…And, if we had to take a guess of where that one extra entity can be found, the answer would likely be in the mind and/or heart of Cougar Head Coach, Ralph Carusillo….A mentor who preaches the mentality that every role has value and that no assignment is too small, when you don the SJB red and black, you quickly learn that you can and will be asked to be a wearer of many hats. For the 6’1, 185-pound 10th grader [Maisel], those one million little things that differentiate victory from defeat would assume a variety of different identities in his team’s 17-14 win over Holy Cross during week #7. Actively involved in one way or another in all 17 of the team’s points last Saturday, the Amityville resident’s name may only briefly appear in the box score, but that does not mean he was not a major factor in helping the Cougars improve their record to 3-4 this season (2-3 in league competition). Making his initial contribution in the most understated of manners, Maisel became something of a pioneer in terms of how much emphasis should get placed on the subtleties and nuances of the sport…The first student-athlete in the history of the POTW list to be commended for his cool and steady hands as a holder on PAT and FG attempts, Maisel would be called into duty to fill-in for the usual starter and to his credit, the kicking game did not skip a beat, as Anthony Bossone went 2-for-2 on extra point attempts and drilled a 31-yard field goal (despite a high snap) that gave SJB the early 3-0 advantage. Utilized as a primary blocker (while lined up at TE) during the run game, it would be his willingness to throw his body in the way or would-be tacklers that ultimately sprung teammates, Sebastian Lebron and David Amelemah on their respective 10-yard TD runs in the 2nd and 4th quarters…The Amelemah score occurred in the last 2:00 of regulation and proved to be the eventual game-winner for St. John the Baptist….And while the touchdown will get all the press, what needs to be mentioned and treated with equal reverence is the notion that had it not been for a 25-yard reception on an earlier possession, followed by a fumble recovery after an untimely SJB turnover, both of which came courtesy of Maisel, the ball never would have been buried that deep in Holy Cross territory. Conjuring up that last adrenaline rush on the final defensive series of the contest, Maisel would again have a nose for the ball, as it was his interception with 58 seconds left in the game that put the “w” on ice…He was also credited with a season-high six stops (1 TFL) as a member of the defensive backfield. A testament to the depth and strength possessed by the Hicksville based school along the line of scrimmage, the 6’2, 240-pounder out of Amityville is the second two-way lineman from the Titans to be featured this season in the POTW article. He joins week #2 selection, John Stroughn in being honored for his selfless and consistent toughness in the trenches. Only a sophomore, it goes without saying that during the next two years, Tobin is sure to inherit the leadership role on both sides of the line. 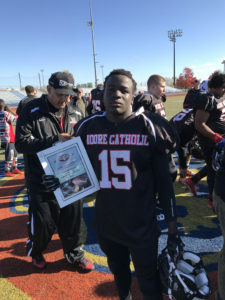 An individual who has already had repeated flashes of brilliance throughout the 2018 season, if he is this good as a 10th grader, just imagine the carnage he will lay out as he continues to add size and perfect his technique. Enjoying a breakout performance in Holy Trinity’s week #7 35-14 conquest of St. Francis Prep, Tobin would rewrite his personal record book, tying for top honors on the team [alongside Stroughn] with nine total stops (5 solo), while also adding career-highs in sacks (3 for a cumulative loss of 12 yards) and tackles for a loss (3)…Checking off even more boxes, he would both force and recover a fumble. An immovable beast in the center of the DL, with Tobin plugging all potential holes, the HT defense would limit the Terriers to a tie for their lowest quantity of rushing yards this season with 132 (38 below their 2018 average)…His body of work as a pass rusher would not go unnoticed either, as the pressure he applied to St. Francis signal callers was so fierce that it yielded a sub-50% completion percentage (6-for-13) and helped to create an interception. The registered 36.1 QB rating was a -15.6 from the SFP’s 2018 average. Offensively, he, along with the rest of his line mates, did so much “road grading” that the town of Oyster Bay’s Highway Department might as well have sent them the cones and vests to complete the look…Executing the often under-appreciated grunt work, the Holy Trinity offensive line made it possible for their rotation of running backs to combine for a season-high 347 yards (led by Spencer Nixon’s 155 yards on 24 carries) on the ground and four (two by Jason Brown) rushing TDs….On the year, the Titans are now averaging 259.6 yards running and are scoring 3.7 TDs on the ground per outing. 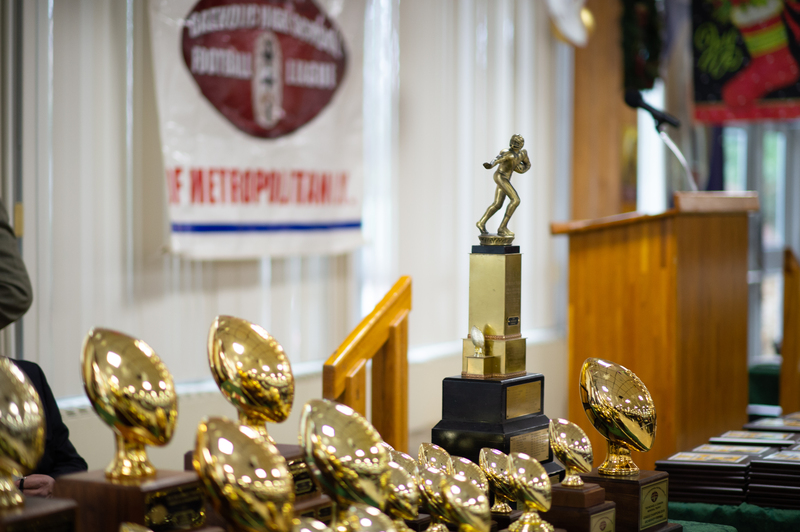 Winners of six games in a row after dropping their season-opener to defending AA titlists, Kellenberg Memorial, Tony Mascia’s Titans have locked up 2nd place in the Double-A Eastern Conference and have their eyes on raising some hardware. One of the most cliched phrases in the English language is, “It’s like riding a bike.” Time and time again, this expression has been used to hint that certain skill sets remain with you no matter how much time has passed…And on October 20th, the 6’1, 170-pound Brooklynite [Langan] more than provided enough evidence to confirm that playing the quarterback position is a talent that never deserts you. Starting under center for the first time since his sophomore campaign in 2016, Langan may have only successfully completed two of his seven attempts. 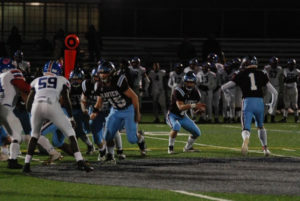 But, when he did connect, he made sure that those strikes did maximum damage, throwing for a pair of touchdowns in the Clippers’ 12-9 win on the road over Moore Catholic. Entering last weekend having thrown just two touchdown passes (both last season as a reserve) in his three-year varsity career at Xaverian, Langan would rally the troops from a 9-0 deficit at the break by tossing one touchdown apiece in each of the two remaining quarters. The Clippers would get on the board on the opening drive of the third quarter when Langan found junior, Shane Greene, from six yards out to make the score 9-6 in favor of Moore Catholic….The scoreboard would remain unchanged until the last two minutes of regulation when Langan would make the Mavericks pay for a turnover deep in their own zone by playing pitch-and-catch with Justin Wolf on a 9-yard dart for the game-winner. Langan, whose career-best 38 yards rushing joined his 17 yards passing to give him 55 yards of total offensive production, earned the praise of Head Coach, Mike Jioia, as much for what he did not do as he did for what he was able to accomplish during the seventh week of the NYCHSFL season…Running the offense in an intelligent, flawless, turnover-free manner, he was everything his mentor could have asked of him. 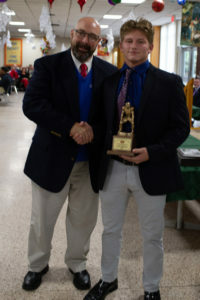 Langan’s five tackles from the linebacker position aided the Clipper D-unit in holding Moore Catholic to their lowest point total of the season (averaged 35 points per game thru week #6), as well as completely smothered a running attack that was averaging 245 yards to the tune of allowing just 79. Competing in their first season as a Double-A school, the win over Moore Catholic, which raised their league record to 4-1 (4-3 overall), officially clinched the Western Conference title for Xaverian. Don’t look now but all of a sudden, this Crusader squad is starting to look like the title contenders that we predicted they would be at the onset of the season…Victorious in their last two triple-A division contests, the Mike O’Donnell mentored program has gone from #7 seed in the postseason status all the way into the conversation for a potential top-3 bid…Acting as a constant during this mini, late-season surge has been the 5’8, 175-pound senior tailback [Wise]. 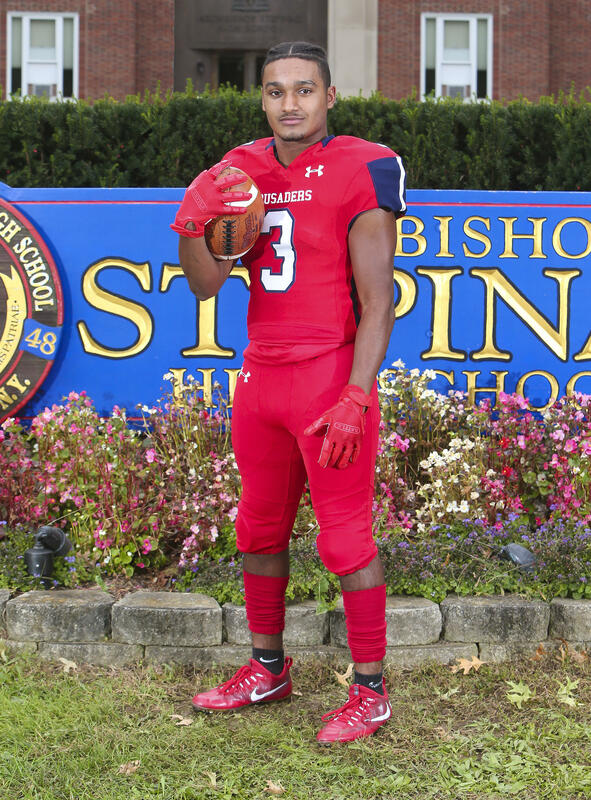 A week removed from posting the first 100-yard rushing game (16 carries, 120 yards) of his scholastic career in Stepinac’s 35-17 win over Monsignor Farrell, the Harlem resident would find an even higher gear this past Saturday, setting new personal bests in both yardage and touchdowns scored in the last regular season home game of his high school journey. The end result for the Crusaders would be a dominant 52-26 triumph over Christ the King to improve Stepinac’s league record to 2-3 and their overall record to 3-4. Called upon to accept a much greater role in the ground attack while starting running back, Malik Grant attempts to get fully healthy for the playoffs, Wise would be the only Stepinac student-athlete during week #7 to log double digit carries, as he took the hand-off on 15 different occasions…A 200-meter specialist during the Outdoor Track & Field season, #3 in your media guide would certainly have the pistons firing on all cylinders last weekend, as he averaged 11 yards per touch to finish the afternoon with 165 yards on the ground. 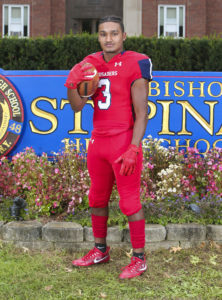 In addition, he would notch the first multiple rushing TD effort of his time in the red, white, and blue, scoring on a 2-yard run in the last minute of the 1st quarter to give Stepinac a 14-0 lead, before breaking off a 67-yarder approximately six minutes later to make the score 21-7. Equally as effective a playmaker out of the backfield as a pass catcher, Wise would also establish a new high for receiving yards, gaining 55 on two grabs. Rounding out his 280-yard all-purpose showing, Wise added a 60-yard kickoff return. The very definition of a renaissance man, wise heads into the regular season finale ranked 2nd on the team in rushing yards (376), receptions (20), receiving yardage (229), and total touchdowns scored (4). “Back-up”? We don’t think so. 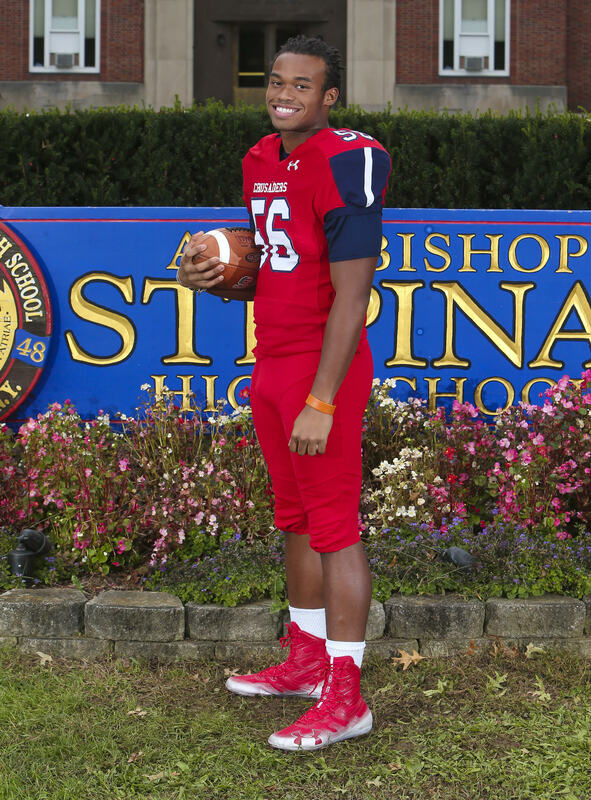 The way he is playing down the stretch, he is more accurately labeled as the “backbone” of Stepinac’s rebirth on the gridiron. For any senior classman, when you reach week #6 of the regular season, it begins to dawn on you that the finish line is inching closer by the second. For some, the realization that the journey is close to reaching its destination is a cause of for added pressure and tightening up. For others, it is a reason to reflect on all you have accomplished while simultaneously acknowledging that there is still business to be completed. Like a diamond, for this second group, the pressure does not hinder them, it brings out the best in them…Kyle Angus belongs to the latter! Putting forth what was without debate the finest overall performance of his two-year career, the 6’1, 190-pound running back needed just eight total touches to record a mind-blowing five TDs in the Friars’ 56-32 Homecoming triumph over their visitors from the Bronx, Cardinal Hayes….In doing so, he became the first St. Anthony’s player (excluding TD passes) to score five touchdowns in a single game since Rob McCann accomplished the feat in November of 2014…Unlike McCann, who caught all five of his TDs, the all-purpose tailback would showcase all of his tools, running for three touchdowns and making a pair of TD grabs to demonstrate the balance of his repertoire. Scoring the first 6 of his 30 overall points on a 62-yard 3rd&19 swing pass on the Friars’ opening possession, Angus caught the ball near the sideline but then cut back towards the middle of the field where he ran undisturbed the rest of the way to give STA the early 7-0 lead…His second touchdown of the 1st quarter came two minutes and 40 seconds later, when following a Cardinals kickoff return to even the score at 7 apiece, Angus would put the finishing touches on a 5-play, 84-yard drive by plunging the ball in on a 7-yard run to make the score 14-7. With his team now enjoying a comfortable 35-14 lead at the break, Angus would pick up where he left off, running a carbon copy route of his first TD on the second play of the 2nd half and taking it 47 yards to the house for his second touchdown reception of the evening…He later tacked on two additional third quarter TDs on runs from distances of 51 and 1 yard to account for his full array of tallies. All in all, Angus carried the ball five times for 68 yards and added another 119 yards on three grabs to conclude the game with a season-high187 all-purpose yards….On the season, he has now rushed for 239 yards on 47 carries (tied with QB, Greg Campisi for team-lead with 7 TDs) and made 22 catches totaling 392 yards (4 touchdowns). 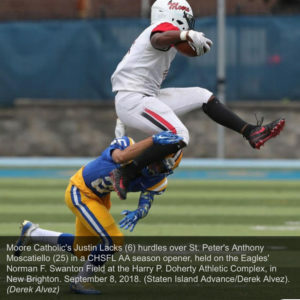 His 11 combined touchdowns leads the “AAA” division and ranks him 3rd overall among all NYCHSFL competitors. 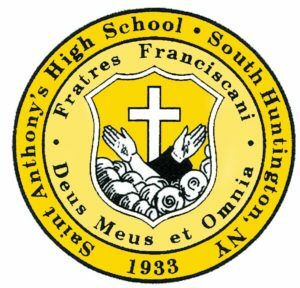 Up next for Angus and the Friars is the game that all LI/Westchester football fans have been waiting weeks to see go down…A clash that will determine the top seed in the triple-A playoffs, St. Anthony’s will have the luxury of playing on the friendly confines of Cy Donnelly field when they bang heads with Iona Prep…The top-2 highest scoring teams in the NYCHSFL, Iona Prep comes to South Huntington averaging 43.8 points per game; the host Friars counter with a 41.2 PPG average…DON’T BLINK, because points will be quick and plentiful on October 19th. If you wanted to know the last time that the Crusaders entered a weekend stuck in a four-game drought, you would have to turn back your calendar all the way to the 2006 season. 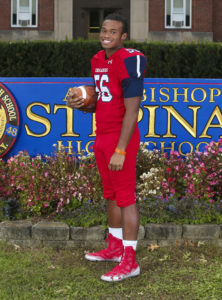 However, this was precisely the circumstance that the Westchester based program faced when they hosted Monsignor Farrell last Saturday night…But thanks to the 5’11, 175-pounder Mount Vernon resident, that slide would not reach five, as Harris would come up big in the second half to aid Stepinac in their 35-17 win over their guests, Monsignor Farrell. 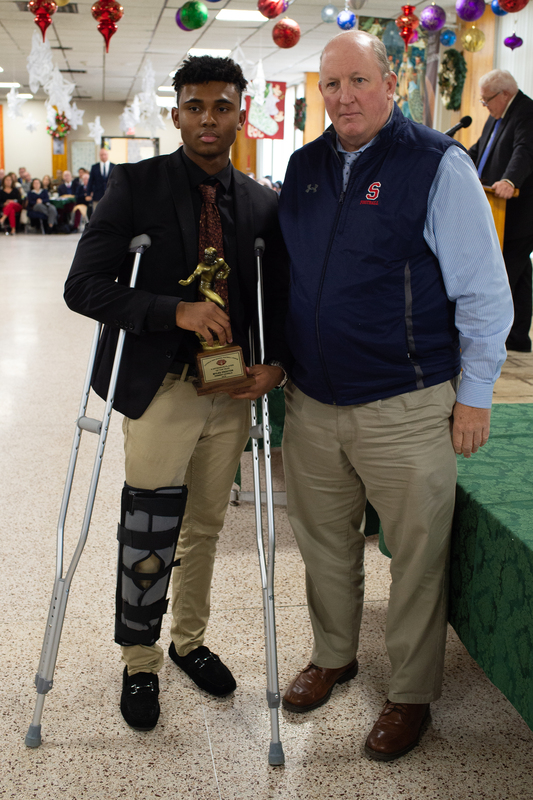 One of the most naturally blessed athletes anywhere in New York State, Harris is capable of beating you in so many diverse ways and during week #6, he would put this versatility on full display. Trailing 20-17 at the time, the 2018 Super-11 selection (signifying him as one of the top student-athletes in the Hudson Valley region) would be a definitive momentum shifter late in the 3rd quarter when he made a jumping catch 40 yards down field in tight coverage and then turned on the burners to trek the final 20 for what would be the game-winning score as the O’Donnell mentored school took a 21-17 lead…The Harris touchdown catch (one of three grabs he made for 82 yards) would ignite a streak of 21 unanswered points, enabling the Crusaders to pull away during the last 16 minutes of regulation. Respected and feared as much for his special team prowess as he is for his pass-catching talents, Harris (with his school’s advantage having been increased to 28-17) emerged with what could best be considered the final nail in the Lions’ coffin half way through the 4th quarter when he fielded a punt on his own 30 and raced from sideline to sideline before cutting back to the center en route to going all the way for the 70-yard TD return for his second score of the half…Earlier in the game, he also returned a kickoff 60 yards to raise his cumulative output to 130 in this facet of the game…Factoring in his production as a receiver, his grand total was 212 yards. 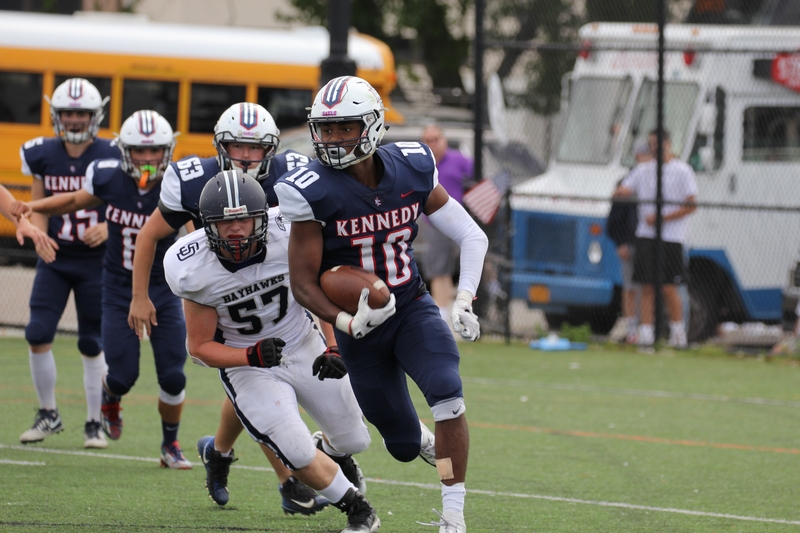 With there still being plenty of time to earn a top-4 seed in the postseason, Stepinac would look to build off of their first league win of the season when they host Christ the King on October 20th. Famous author, Napolean Hill once wrote, “It is literally true that you can succeed best and quickest by helping others to succeed. And in the case of the 6’1, 215-pound Staten Island resident, no words could be more genuine. 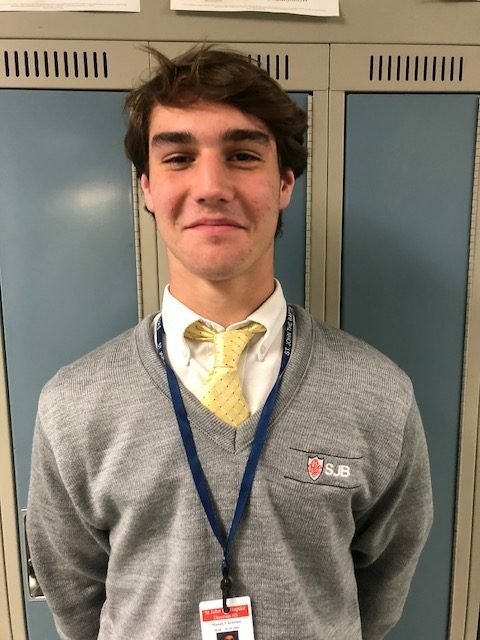 A gentleman who proved that gaudy statistics are not a prerequisite in order to be considered for POTW honors, in the words of his Head Coach, George Mahoney, Cullen “did a bit of everything” in leading the Eagles to the 15-0 victory over Xaverian this past Friday night. On the offensive side of the gridiron, the STP senior would be utilized as a spot ball carrier, taking the hand-off only six times in total, but maximizing each opportunity to finish the game with 41 yards on the ground (6.83 average per touch)…While he himself may not have been afforded the euphoria that accompanies punching “one in for the six”, Cullen’s contributions were undeniably valuable as his efforts came during two extended drives in the 1st and 4th quarters that eventually translated into all of the Eagles’ points on TD runs by teammates from Eric Torres and Kaiwan Taylor. Defensively, Cullen has emerged as a game-changer during the past three weeks. Starting the season as more of a pass coverage OLB, since making the conversion to the Mike linebacker, both the individual and the team have enjoyed an elevation in overall performance…Free now to “wreak havoc all over the field” as it was expressed by Mahoney, Cullen would be credited with five tackles, 1 TFL, four QB hurries, and even managed to recover a fumble in helping his school even their record to 3-3 on the year…With him at the center of the D-Unit, St. Peter’s not only pitched their first shutout since the 2014 season, they also limited a very capable Clipper offense (entered averaging 248 yards of total offense and 21.2 points per contest) to a meager 163 yards of cumulative output (their second lowest of 2018). As a whole, the reassigning of Cullen has transformed the Eagles defense from a group that was surrendering nearly 30 points per game through three weeks into a dominant, shutdown brood that has allowed just 20 points total in weeks 4 through 6 (6.7/average). 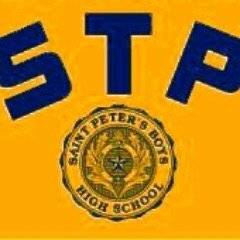 Cullen and the new look STP “D” will face a huge test this coming weekend when they go on the road to face a Kellenberg juggernaut that is putting up 40 points and 400+ yards per outing. If there was ever a student-athlete born to be a future NYCHSFL player of the week honoree, it is a young man with the name Nazareth…And, much like Christians travel far and wide in order to visit the birthplace of the savior, the two-way player who hails from Queens Village would go on a journey of his own during week #6, propelling St. Francis Prep to their first win of the season, 28-21, over rival Holy Cross, on October 14th. 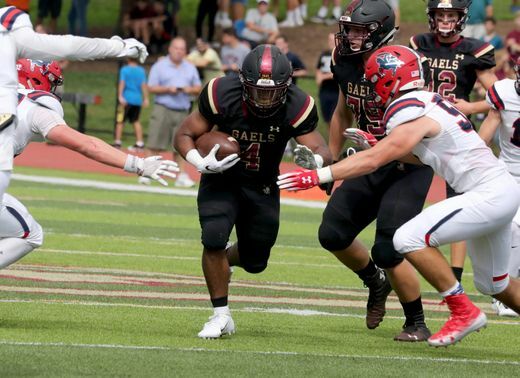 Eight days removed from rushing for a career-high 143 yards (on 21 carries) in a loss to Fordham Prep, the 5’9, 188-pound senior would again be at the top of his game last Sunday, surpassing the century mark for a second consecutive weekend and the third time in his career (ran for 114 yards against Mount St. Michael almost exactly one year prior; Oct. 15th versus Mount St. Michael Academy,)…Darn-near mirroring his personal bests from week #5, McFarlan was a workhorse for the Terriers, handling the prolate spheroid 24 times (more than double his closest teammate) for a gain of 142 yards, with one TD…The crux of an offensive scheme that strives to break their opponents’ will with long, sustained drives, McFarlan would immediately take some of the wind out of Crusader sails when he orchestrated a 9:00 1st quarter drive. Running for 401 yards and four touchdowns as a junior, McFarlan has already exceeded his production in one category (currently has 420 yards rushing in 2018) and needs just two more scores to establish a new landmark in the other…Not surprisingly, he is the #1 person across the board for SFP in all run-related matters. Rounding out his afternoon, McFarlan also made his presence known on defense, recording five stops to equal his tackle total from all of 2017, with 32. 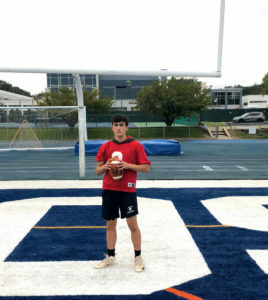 Don’t look now but it appears that Mike Corona’s Vikings have their own mini Peyton Manning clone in the person of 5’9, sophomore field general [Tucker]…Trailing the majority of the game (with the exception of an early 6-0 edge), SJS would join St. Francis Prep in breaking into the win column (1-5) during week #6 when a 30-yard Hail Mary by Tucker landed in the leaping arms of senior WR, Ryan Simermeyer, to catapult the Staten Island school to a dramatic 40-35 victory. Needing “only 42” more 4th quarter rallies to tie the future NFL Hall-of-Famer’s record for career comebacks, the parallels between Tucker and Manning extends beyond a mutual clutch gene…Rather, just like the legendary Colts/Broncos field general [note: now 2nd in career passing yards to Drew Brees], the SJS 10th grader is proving himself to be a master at chewing up opposing secondaries with laser precision…Following a 17-for-29 (58.6%) passing game on October 12th that saw him throw for 263 yards and hurl three TDs, Tucker presently tops all AA quarterbacks in both total aerial yardage (1,354) and completion percentage (59.6%; 102-for-171). His 10 TD tosses puts him in a four-way tie for runner-up honors among the double-A elite. And while the deep ball into the corner of end zone with 1.8 seconds showing on the clock will be the moment that gets remembered forever, let it be known that as great of a play as it was, it represented only one of the four total touchdowns in which Tucker played a role in. In addition to the game-winning score, Tucker had previously connected with Simermeyer earlier in the game, and also hit junior, Kyle Gaor, for the latter’s first TD of 2018….As an added bonus, Tucker was the Vikings’ leading rusher as well, accumulating 54 yards on seven carries while punching in his second running TD of the year. 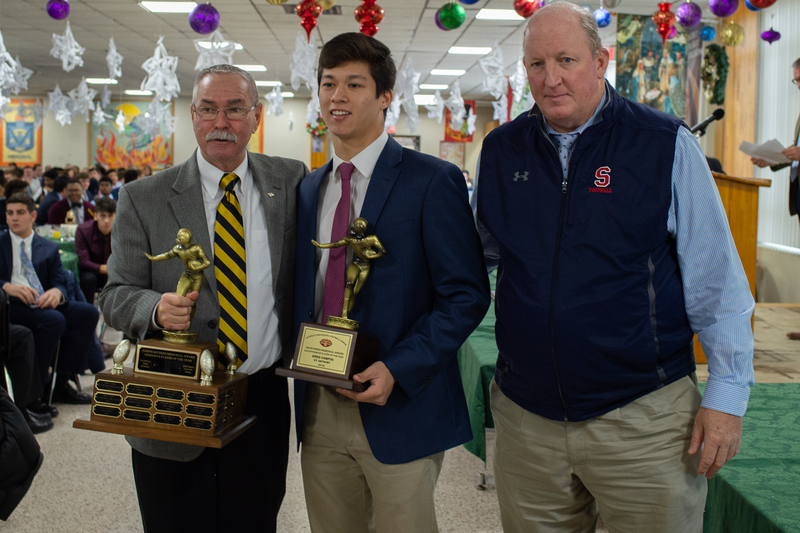 When Tucker and Joe’s by the Sea returns to the field this Friday, they will do so against the current first-place team in the “A” division, Kennedy Catholic….A clash of styles, the host Gaels will attempt to slow down SJS’s bomb squad by relying heavily on their two-headed monster [Surrett and Proctor] of a ground attack…Allowing an average of just 61 yards in the air against Catholic school opponents, KC has yet to face a QB as polished as Tucker, so it will be interesting to see how their defensive backfield responds to the pressure. We don’t know if the 5’9, 163-pound senior from the Bronx is a fan of the Karate Kid, but one thing is for certain, he certainly subscribes to that same, “strike first, strike hard, no mercy” philosophy made popular by fictitious sensei, John Kreese. Zoned in from the opening whistle, it would take Simmons no time at all to set the tone for the kind of memorable day it would be for both himself and MSMA in their 35-0 goose-egging of Cardinal Spellman in a battle for Bronx bravado. Recording the first rushing touchdown of his scholastic career when he broke for a 65-yard gainer on the Mountaineers first possession of the game, Simmons would only carry the ball on four separate occasions, but inflicted maximum damage to the Pilots’ defense, concluding the game with exactly 100 ground yards. 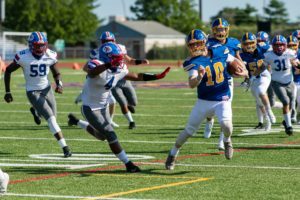 Used almost exclusively as a defensive player last season and having never run for more than 79 yards in a contest this year, the triple digit effort last Saturday was the first of its kind for the Mount student-athlete. He was one of two Mountaineers on October 13th to reach the century mark, as teammate/Week #1 POTW honoree, Conrad Perry, led all RBs with 189 yards. And like all of the charges under the command of Head Coach, Mario Valentini, the job is only half done when you put points up on the board. Instead of resting on one’s offensive laurels, the focus immediately shifts to “D”, where Simmons would also show himself to be spectacular. A major factor in MSMA’s ability to earn the program’s first shutdown since the 2013 season (34-0 over now defunct Bishop Ford), one of Simmon’s pair of interceptions would come in the end zone, keeping the shutout in tact…A physical presence as well as a ball hawk, his six solo tackles last Saturday were tops on the team. 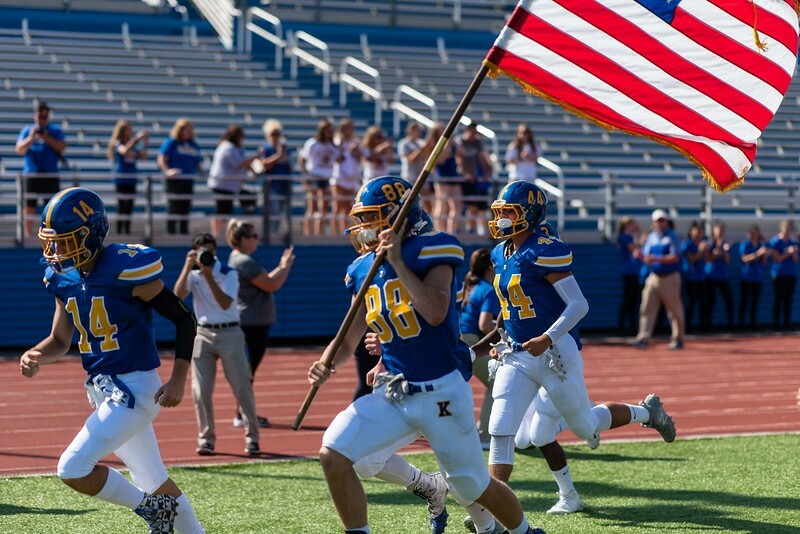 The reigning “AA” Defensive Player of the Year commenced last Sunday afternoon by leading the Firebirds onto the field in his traditional manner, sprinting with Old Glory waving proudly in his arms. 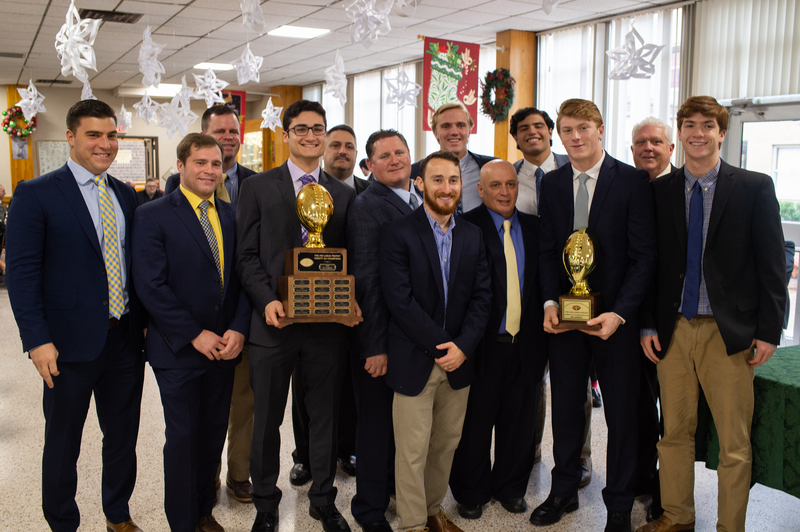 The pregame ritual, which the Levittown native has doing since the second week of the 2017 season, would hardly be the last time he would be at the forefront of a charging Blue & Gold platoon during Kellenberg’s 42-14 shellacking of host Chaminade during the 2018 Marianist Bowl…The victory, which snapped a five-game losing streak in the series (KMHS last won in 2010) marked just the third time ever that the Firebirds bested the Flyers on the gridiron. Energized and/or inspired by the large contingent of family members in attendance, the future United States’ Naval Academy Midshipman would play one of, if not the most complete games of his varsity career, tying his personal-highs for tackles (11) and tackles for loss (3)…In truth, while those numbers certainly stand out in their own regard, they almost fail to do justice to the 6’3, 195-pound, three-sport athlete (2018 Varsity basketball Most Valuable Player; 2017 CHSAA Lacrosse State Champion)…For those watching the game in person, the three tackles for a loss (plus a sack) with which Wilson was credited seemed on the low end…#88 spent so much time in the Chaminade backfield that he might as well have asked his parents to hire a moving truck so he could set up permanent residency there. The heartbeat and backbone of the #1 ranked defense in the double-A division (#2 in the entire NYCHSFL), with Wilson setting the example, the Firebirds are allowing just 10.3 points per outing. And remarkably, this statistic skewed by the fact in all six of their victories in 2018, the starting 11 often did not play the full 48 minutes. 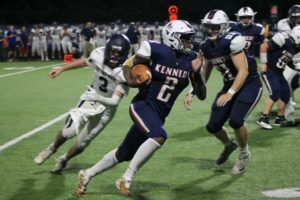 For instance, before subbing in their second and third strings in the 4th quarter, KMHS had held Chaminade scoreless while only giving up 102 yards of total offense through three quarters. 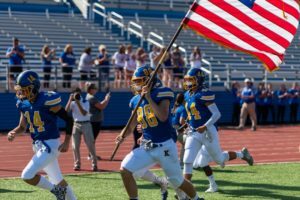 Having passed their biggest test of the season thus far, Kellenberg will put their 17-game immaculate streak on the line this coming Saturday when they return home to play St. Peter’s under the lights.